You may have heard about a little shindig. Each year (starting last year) there’s a gathering of ballhawks at a Major League stadium known as BallhawkFest. It’s more than just a bunch of folks who like to collect baseballs going to the same game though… it’s a whole day/night of activities! This year, there will be two incarnations of this event. Last year, in its inaugural form, BallhawkFest took place at Camden Yards on July 23rd. This year, a different East Coast venue has been chosen… PNC Park (on June 9th). But… after last year’s success and the interest of a bunch of people out here on the West Coast, Alan Schuster approached me with the following question: “Would you be interested in helping to put together a West Coast version?” I was all over it–through a poll of some local ballhawks and discussions between Alan and I we established a date. 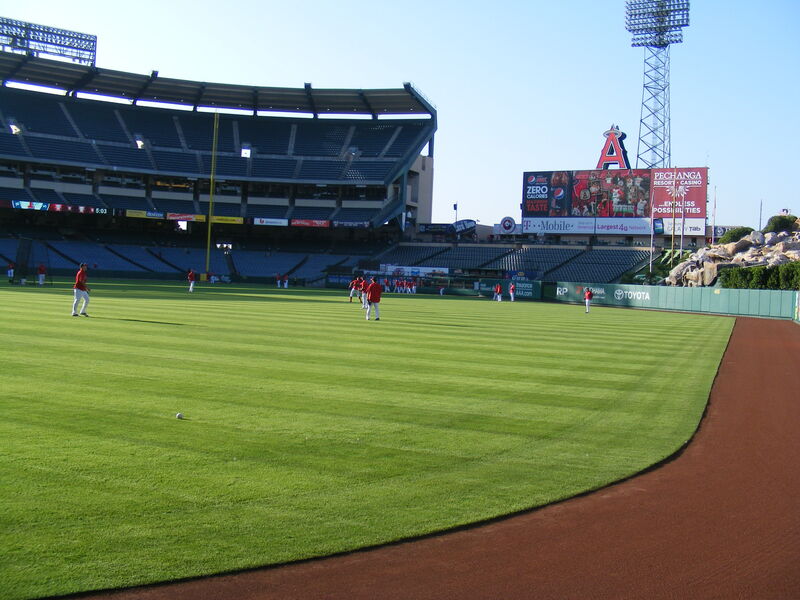 The first incarnation of BallhawkFest to hit California will take place at Angel Stadium on July 28th, 2012! You can comment on here for more information or send me a direct e-mail. Like last year’s festivities in Baltimore, there will be a baseball/softball game in the late morning, a luncheon at a local restaurant, and of course a huge afternoon/night of ballhawking. 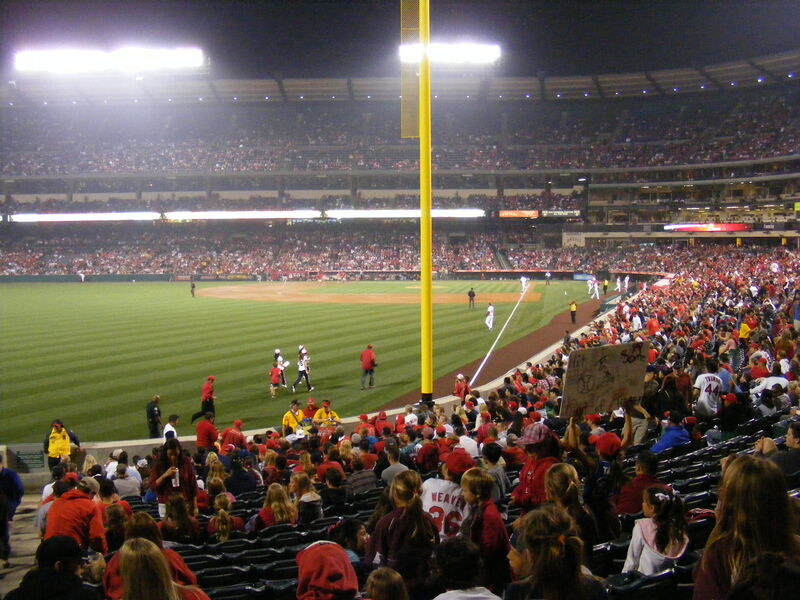 The Angels/Rays game that night starts at 6:05pm… so the gates will open at 4:00pm and we’ll be there. And we’re planning on T-shirts… similar to those used at last year’s festivities! If you want to help plan, donate a raffle item, provide gear for the softball game, or help out in any way–just get in touch with me. Last year’s event in Baltimore had about a dozen participants… I’m hoping for that many (or more) out here in California! And if you’re planning on coming–get your tickets to the game ASAP… there’s a post-game concert that night after the game ends (Goo Goo Dolls, anyone?) so there’s going to be a sizable crowd. Show some love in the comments section. Are you coming? Get ready for a day of friends from far and near and a whole lot of baseball snagging! Guess what? I’d been listening to sports talk radio and I ended up winning two tickets to the Angels/Blue Jays matchup on the 3rd of May. I had high hopes for this game, as it came the day after Jered Weaver threw a no hitter at Angel Stadium… the 10th in club history. The evening before that, Jerome Williams had shut out the Twins on only three hits. Dan Haren would be taking the mound on this particular evening and I figured, if things progressed, it would be a shutout on Tuesday, a no hitter on Wednesday, and a perfect game on Thursday. Makes sense, right? Well, did you read anything about a perfect game? Nope. But that was a ridiculous thought… even though Haren made a similar comment to the media (jokingly). 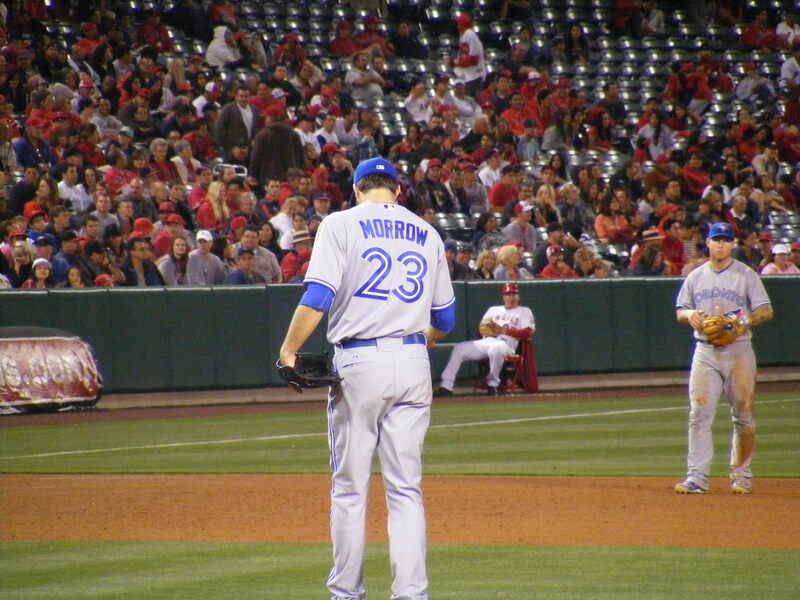 There would be no perfect game… though Brandon Morrow got close. This one would end up being all Blue Jays. But let’s get on to batting practice. I was third in line and Michelle decided to sit in the shade and read and make a couple of phone calls. I raced in and up to the right field seats at 5:05pm. 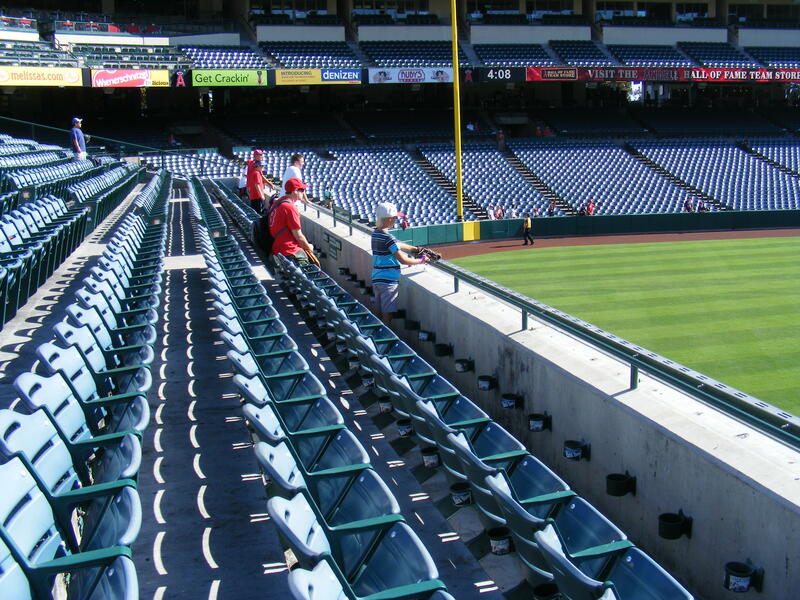 There weren’t any baseballs to be found lying around but I did see Weaver in right field with Bobby Wilson and David Carpenter and took advantage of the empty stadium and the relative silence by congratulating him. He responded kindly and went back to work. And about five minutes later, Wilson tossed me my first ball of the evening. It had a few grass and dirt scuffs and the word PRACTICE was stamped on the sweet spot. I’d gotten several of these stamped baseballs and I turned around looking for a kid to give it to, but there weren’t any in the section. I trotted up the stairs and handed it to an usher to give away for me–and I saw him make a little boy’s day by handing the ball over to him about five minutes later. The next ball I caught came from [former] closer Jordan Walden. He’d already tossed a couple of baseballs into the stands… one in particular to a little kid to my left. Well, this little kid (who already had two baseballs of his own–one from Walden) decided to ask for the next baseball that Walden fielded. The pitcher looked up at him and shook his head no, then I piped up, “Hey, Jordan, how about one for the big kids?” It’s the first time I’ve ever used that line… and wouldn’t ya know it? It worked. He flipped up baseball #2 on the day and I gave that one away to a different usher a little while later. 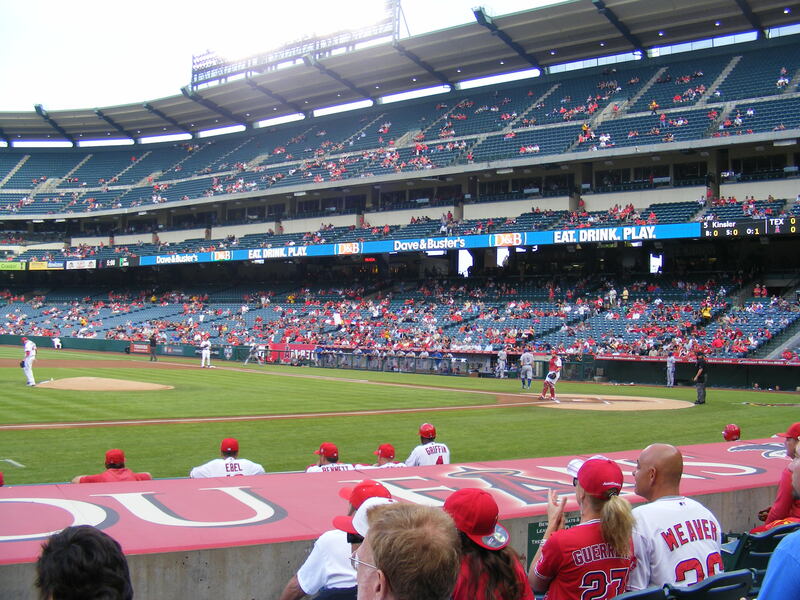 Unfortunately for the BP regulars in Anaheim, the Angels have quite a few righties that can hit the ball pretty far. I call that unfortunate because a lot of baseballs fly out to left and center fields–and there are bullpens and a pile of Disney-era rocks that prevent us from snagging said baseballs. Boy, we sure hope Kendrys Morales (the lone bat from the left side with any power) gets taken out of the first group of BP hitters… at least Mark Trumbo and Albert Pujols hit a few the opposite way into right field for us. 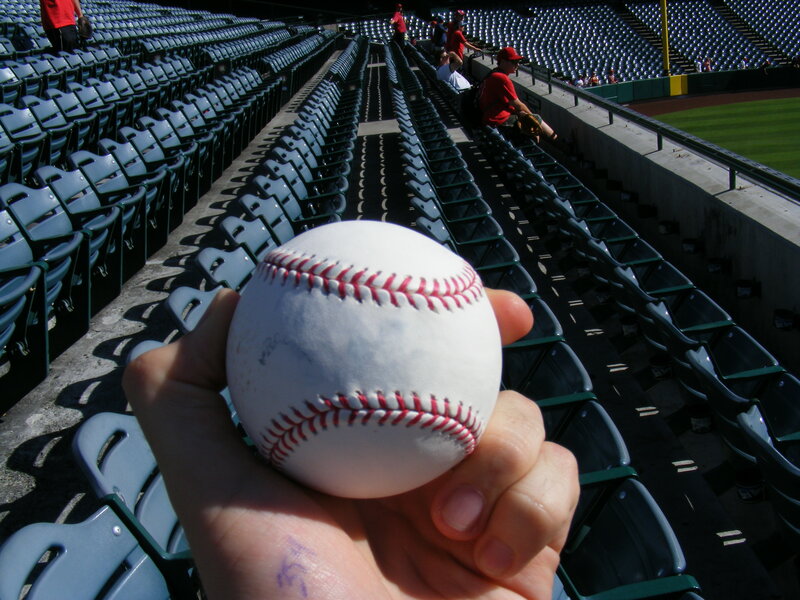 I couldn’t get a glove on any other baseballs while the Angels were hitting though. But the real reason I took that is LOOK AT HOW MUCH SPACE THERE WAS! I should have been close to double digits–note the time–the stadium had been open for forty-five minutes. It was just a struggle to snag anything through Blue Jays BP. The day would pick up for me a bit at the end of batting practice though, as I got three baseballs thrown my way as the Blue Jays ran off the field. The first came from pitcher Drew Hutchison as he headed down the dugout steps. 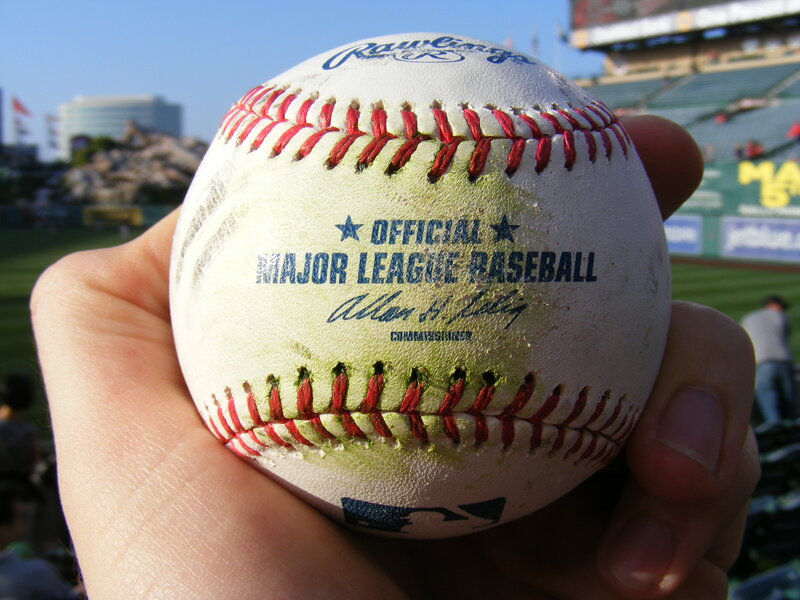 I quickly put that one in my pocket and, as the coaches finished rounding up all the baseballs from BP, hitting coach Dwayne Murphy threw me a ball in the fourth row. But a huge guy with a beard in the third row reached out and caught that one in front of my face… then he looked at me and said, “You already got one.” Well, actually, I’ve already got three. Then Murphy, who must have seen what happened, lofted another ball my way–this one with a much higher arc. And I caught it by reaching out as far as I could, shocking the bearded fellow in front of me. I went on my way to track down my lovely wife, who’d found a spot in the sun to read her book on the field level in foul territory. We grabbed sandwiches (which were delicious… and cost us $9.75 each) and some Cracker Jack and headed out to left field. 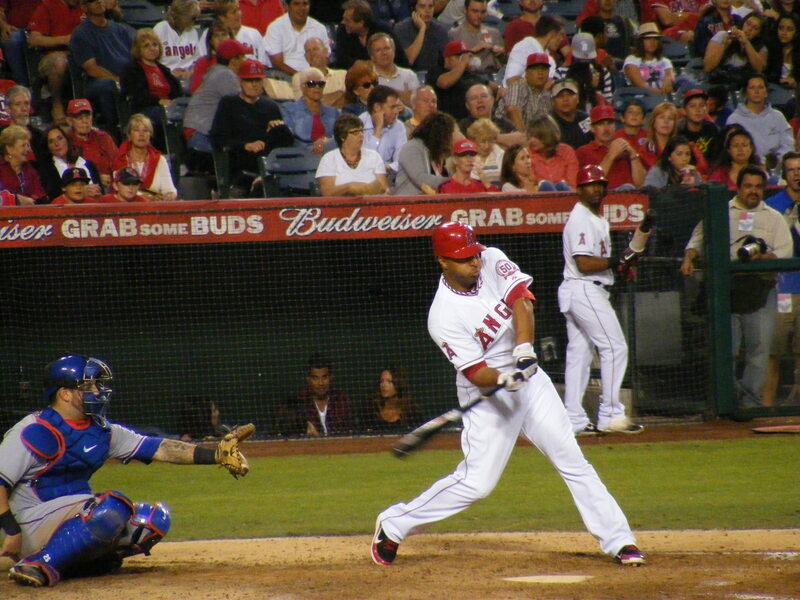 Pujols was still sitting on zero home runs for the year so I figured he was kindly waiting until I was in attendance so that he could hit it to me–ready and waiting–in the left field corner. 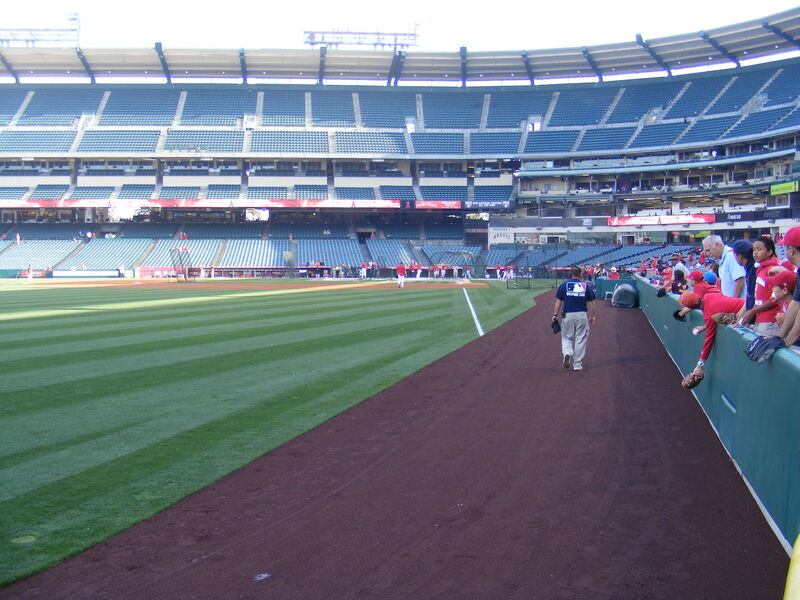 For pregame throwing I hung out by the Angel dugout. Only one pair played catch (Trumbo and Howie Kendrick) and the second baseman kept the ball. I ran to the visiting team’s side and watched as Brett Lawrie threw with Kelly Johnson–then Johnson went into the dugout and Yunel Escobar took over. Well, I was on Lawrie’s end of the dugout, a few rows back, and Escobar ended up with the ball. I was the only one asking if he could toss it up though–so he did… from about forty feet away. Escobar underhanded it about twenty feet high and everyone seated around me just stared as it fell perfectly into my glove. The blue circle represents where Escobar was standing and the red circle shows where I actually caught the ball. Right behind the Blue Jay dugout as they came off the field. But I didn’t see any souvenirs come my way. 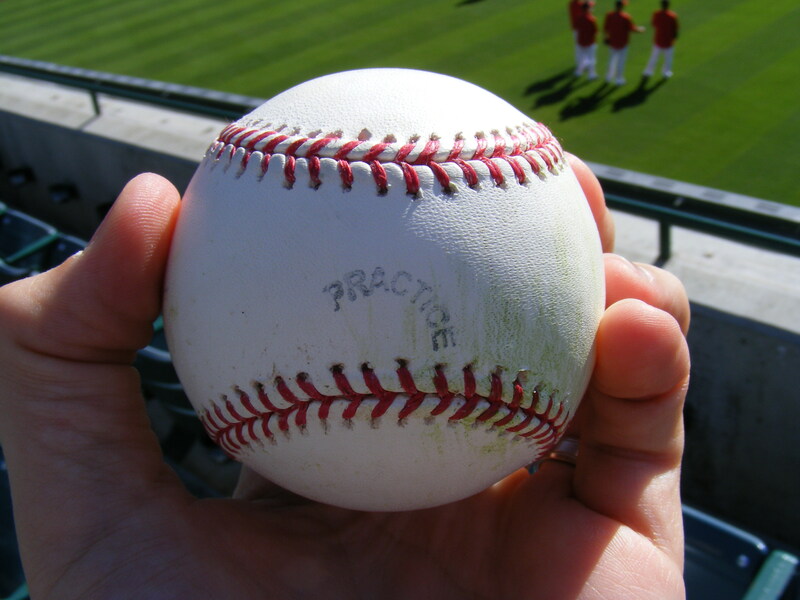 It was a pretty lousy night for Angels fans–I made a young kid’s evening a little happier by giving him a baseball I’d brought with me from a previous game as we left the stadium. I’m always up for a ball game but this particular one wasn’t even close to being up there amongst my favorites. Michelle and I enjoyed our time together–and I simply hoped the next Angel game we’d attend would have a better outcome. It was a beautiful Friday in Orange County and I was off to the Angels game again. This time they’d be taking on the Orioles… and I was hoping for a Camden Yards commemorative baseball. Maybe a few of them would be in the mix. I arrived to the gates a bit later than I would have liked but luckily, a fellow BP regular let me slip into line with him. I was off to left field as soon as the gates were open. 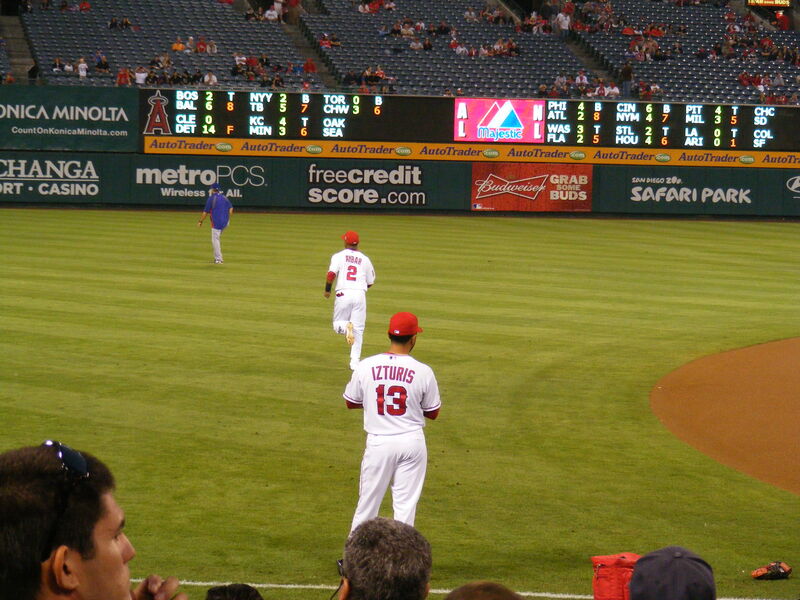 I knew the Angels would be facing a lefty and that everyone (except Bobby Abreu) would be batting from the right side. 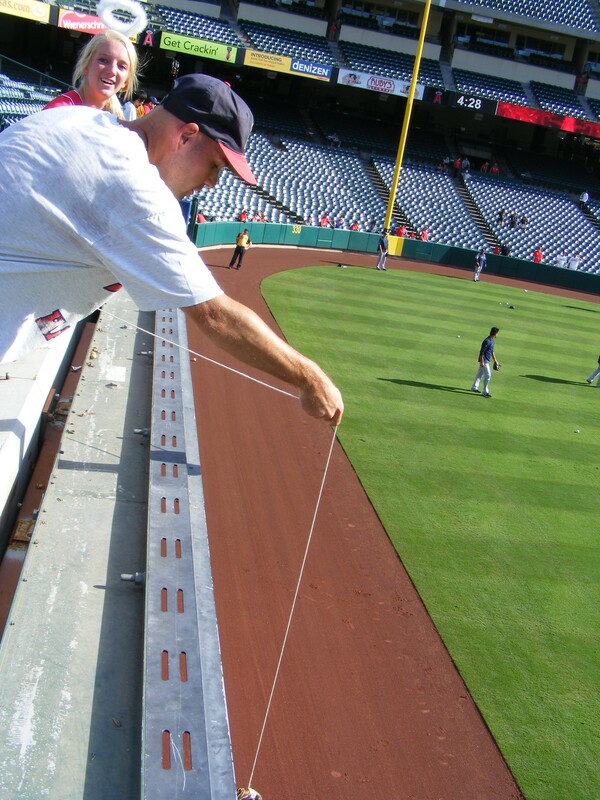 I figured there was a pretty good chance someone would pull a ball or two down the line so I stayed near the foul pole. Awesome! Not a Camden Yards ball–but a commemorative baseball is a commemorative baseball. I won’t complain. Unfortunately, that was the only ball I could get during the twenty or so minutes I saw of Angels BP. They ran off the field and I ran to the other side of the stadium, where the O’s had come out to warm up. As Troy Patton finished throwing with a trainer I asked him for the baseball they had been using. He nodded to me and cocked back his arm to toss it my way but in that instant the trainer he’d been throwing with must have called his name. Patton turned his head to the side and then, sadly, tossed the ball to the trainer–who handed it to a kid in the first row. “What a tease!” the usher near me said. But Patton saw that he’d gotten my hopes up so he pointed my way and actually said to me, “Don’t worry, I’ll get you one.” Then he headed off into right field. All right, Mr. Patton. I’m a fan of yours now–thanks for giving me credit… and a baseball (which you can see over on the left). And I looked at it hoping to see a commemorative logo but it was just a standard Selig ball. I started to run up right field at that point but then realized everyone in the current O’s BP group was right-handed. So, after longing to escape the foul line I opted to hang out there a bit longer, hoping for another shot at a foul ball. Well, wouldn’t you know it? 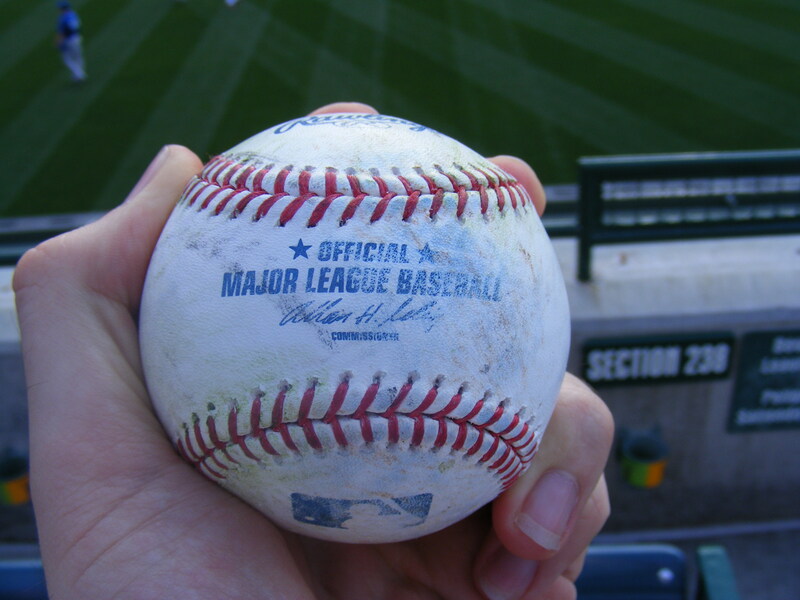 A righty O fouled a ball toward me in Section 130… and I ran up the steps for it and snagged it as it bounced around. I ended up giving that ball away to a young fan… in a Cardinals shirt… weird. And he thanked me–then went to show his family–then came back a minute later and shook my hand and told me he really appreciated the kind gesture. Wow! You’re welcome, kid. Off to right field I went where, inexplicably, I didn’t snag another baseball for thirty minutes. Ugh. The Orioles just didn’t hit many that way and I couldn’t get a single toss up from any pitchers I saw in the outfield. And I got shut out at the dugout after BP, too. The pitching matchup was Jerome Williams against Brian Matusz. And Williams fared better than he did in the Bronx his last time out. He checked the Orioles on three runs in 6.2 innings… his farewell was a two-run homer he gave up to Nolan Reimold… but at that point the Halos had already put up six runs of their own, highlighted by a three-run double by Howie Kendrick (who I am confident will hit .320 this year). 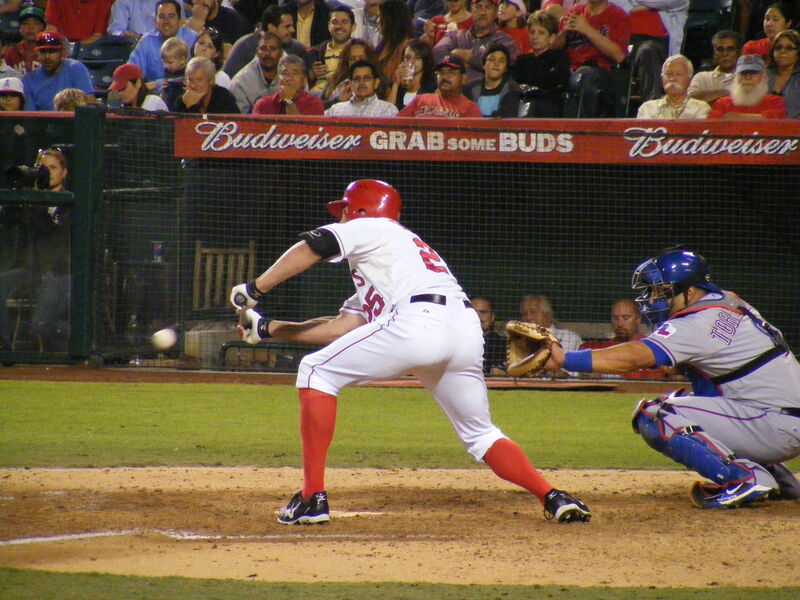 Reimold’s homer was the only one of the game at it went to right-center. Nothing close for me. 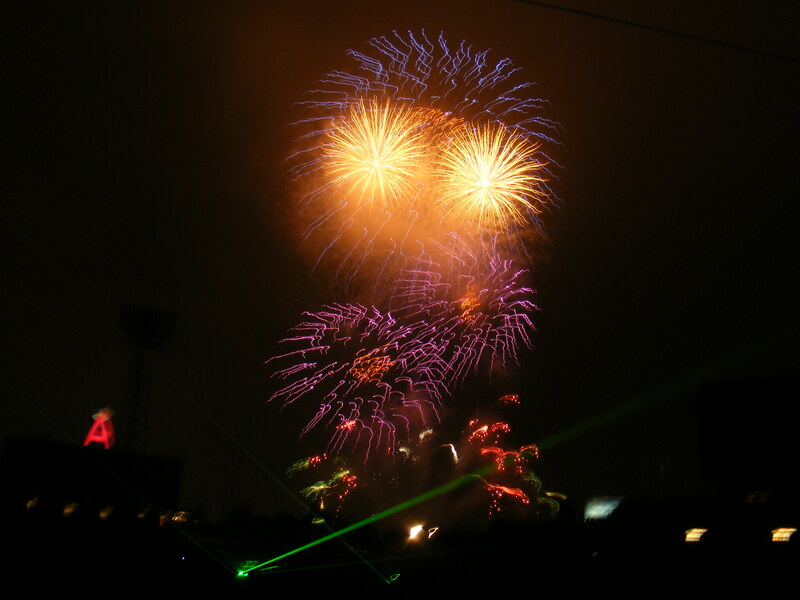 This particular fireworks show incorporated lasers into the mix. It was neat–nothing too spectacular… though I’m a sucker for a fireworks finale–I mean, who doesn’t love a good fireworks show, huh? We booked it out of there right after the finale and were in our car and on the way home before most people had even left the stadium. I was thrilled to watch the Angels get a win. They have been off to a pretty poor start… and Texas has been winning left and right. Yikes! Sadly, as a buddy of mine mentioned on Facebook recently, he is tied with Albert Pujols in home runs this season. Prince Albert’s still sittin’ on a goose egg in that department. I figure he’s just waiting until I’m at another game… how considerate of him! Next up–a trip to Dodgertown! Well, now that the 2012 season is upon us I guess I can finally put up my final blog entry from the 2011 season. I know… it makes perfect sense. 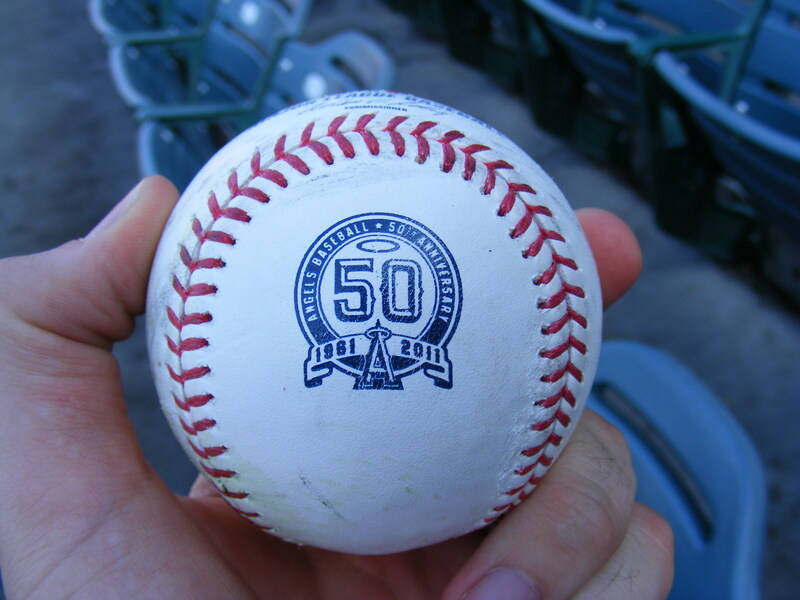 Since the gates only opened 90 minutes prior to the first pitch, we didn’t get to see the Angels hitting–but as the Rangers took their hacks I got my first ball of the day, a commemorative Angels ball, from reliever Mike Adams. I ran to the dugout but didn’t snag anything else there. During the lull between the end of BP and the start of pre-game throwing I got some water and rested. Then, I chatted with some other ballhawks and took a few photos. Around 3:30, the players finally emerged for their warmups. I stood in the fourth row on the aisle and ended up getting a ball thrown to me by Mike Trout for the second consecutive day! 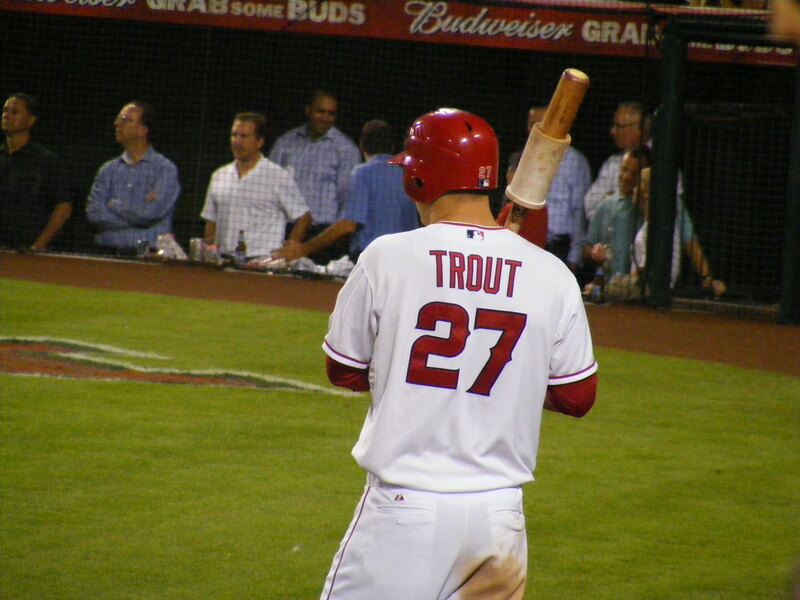 Trout’s in the center with the ball in his hand in the photo above. Then, I ran to the Ranger dugout and just missed getting the ball Elvis Andrus and Ian Kinsler used during their pregame throwing. 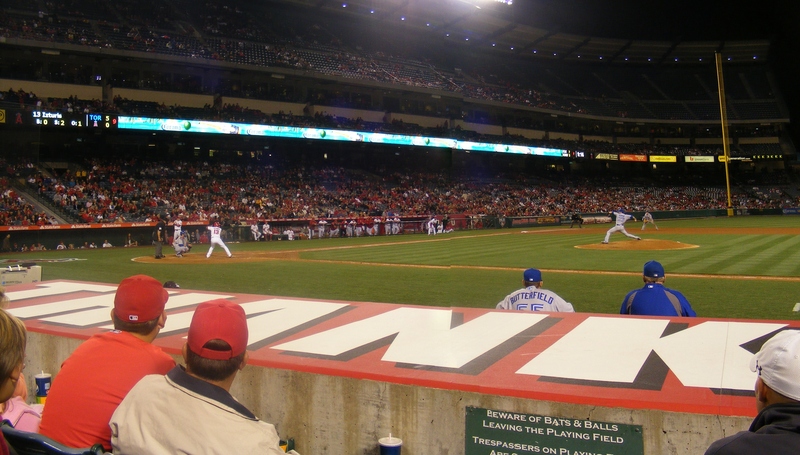 With three baseballs snagged, I found a seat behind the Angel dugout to watch the game. While the Rangers started all of their regulars, the Angels lineup featured several backups (Mike Trout, Bobby Wilson) and some minor league callups (Gil Velazquez, Efren Navarro, Jeremy Moore). 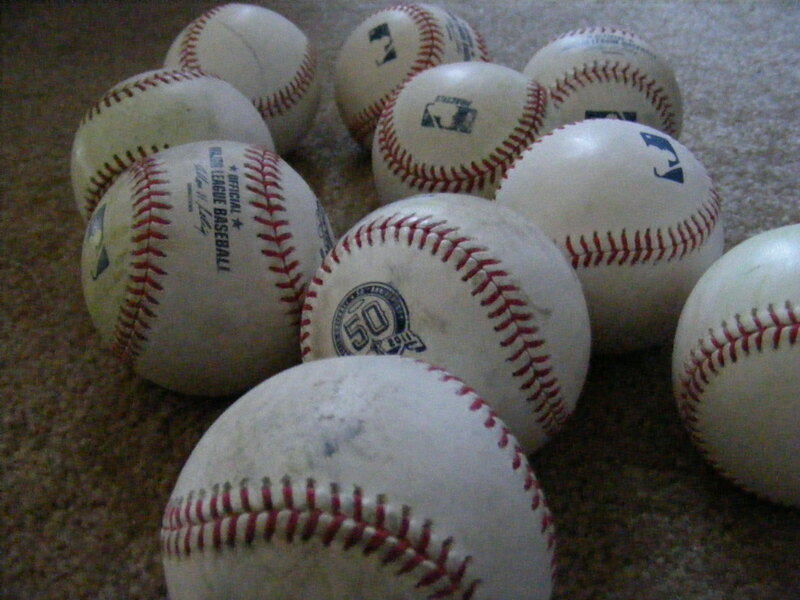 Despite my efforts, I was stuck on three throughout the game and I would end the 2011 season with 385 total baseballs. –and then Napoli crushed a home run into the stands. And the Angels couldn’t score in the ninth. They were swept in three games by the Rangers on their own turf. Now–recovering from the Angels loss was easy–securing a post-game freebie from their dugout wasn’t. Even though several baseballs, batting gloves, and even a couple bats came up over the dugout roof, I couldn’t get my hands on anything. Later, I found out Greg’s dad had secured an Erick Aybar bat–which I would later mail back to New York for them. I hung out in the quickly-emptying seating bowl, knowing I wouldn’t be back for several months. It had been a fun three games. I was sad to see the 2011 season go, but by the time you read this we’ll already be into the 2012 season. How ’bout that? 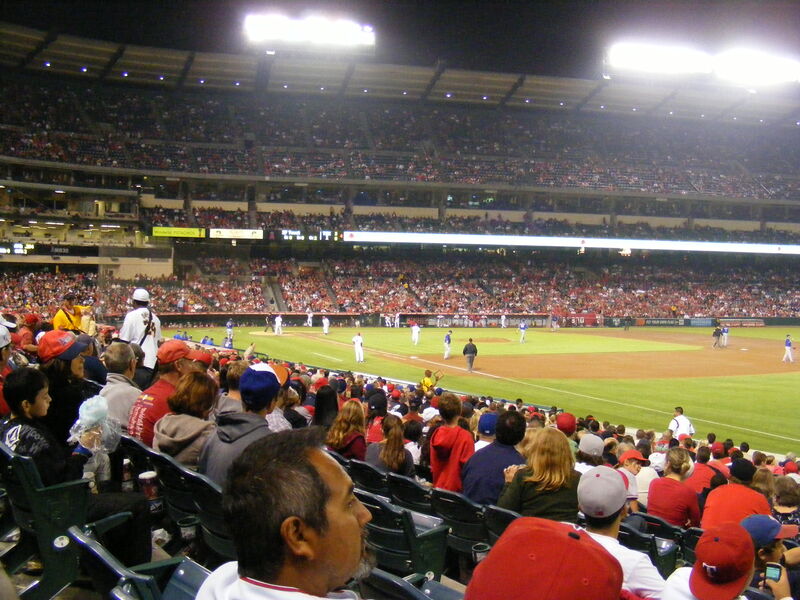 My first game of ’12 will be on April 16th–right back at Angel Stadium. 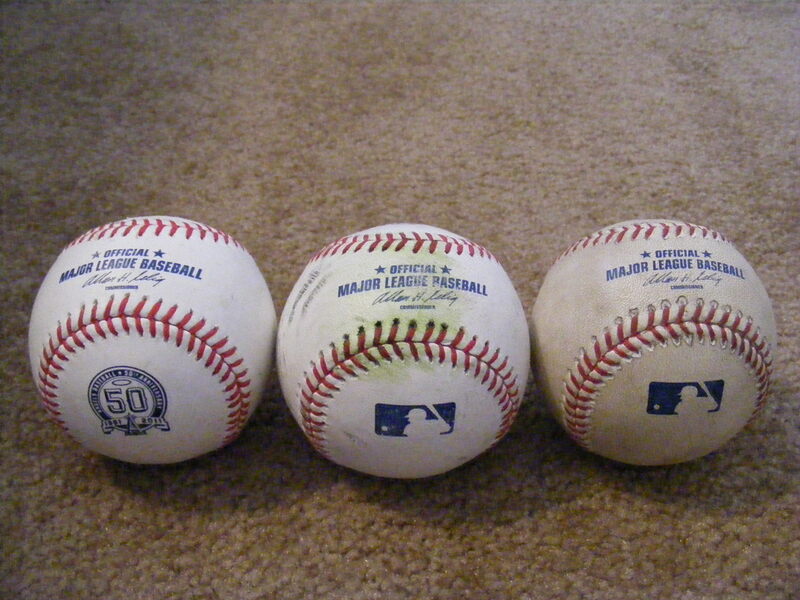 I entered the day sitting on 369 lifetime baseballs. When I approached the Home Plate Gate I surveyed the line situation to see where I should situate myself. Upon closer inspection I saw a friend from 3,000 miles away. I walked up to Greg Barasch and told him, “I didn’t know you were going to be here!” Greg and I had met in April of 2010 at my only visit to Citi Field. 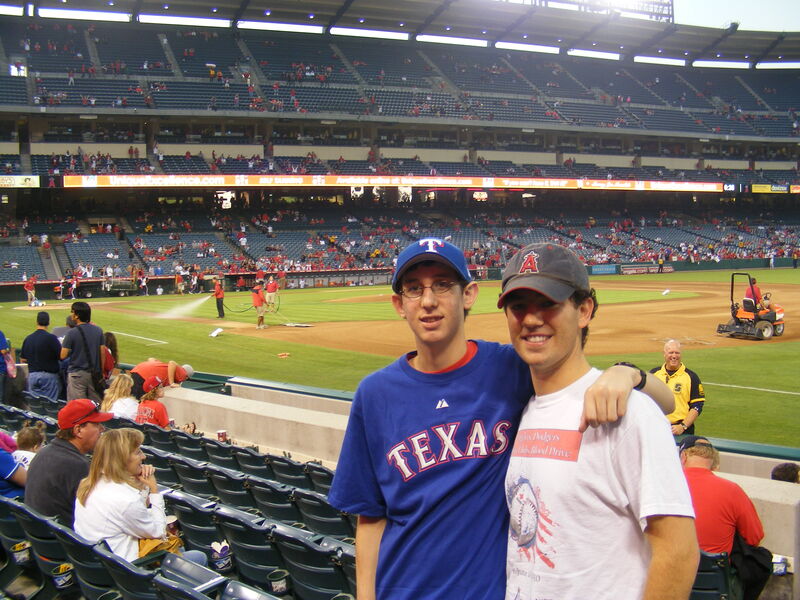 As it turns out, he and his father would be in Anaheim for the last three Angels home games of the year–just like me. Greg and I played catch for a few minutes while his dad held our place in line. Michelle had decided to sit in the shade and read for a while and I knew I’d meet up with her after batting practice had finished. 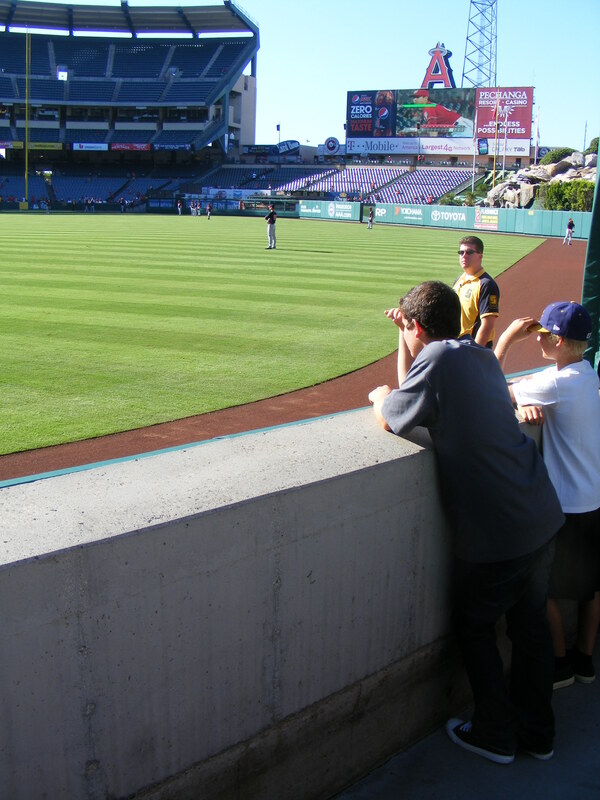 When the gates opened I immediately took of for the right field corner and within minutes, got a ball thrown to me by Hank Conger. That ball–see it on the ground. 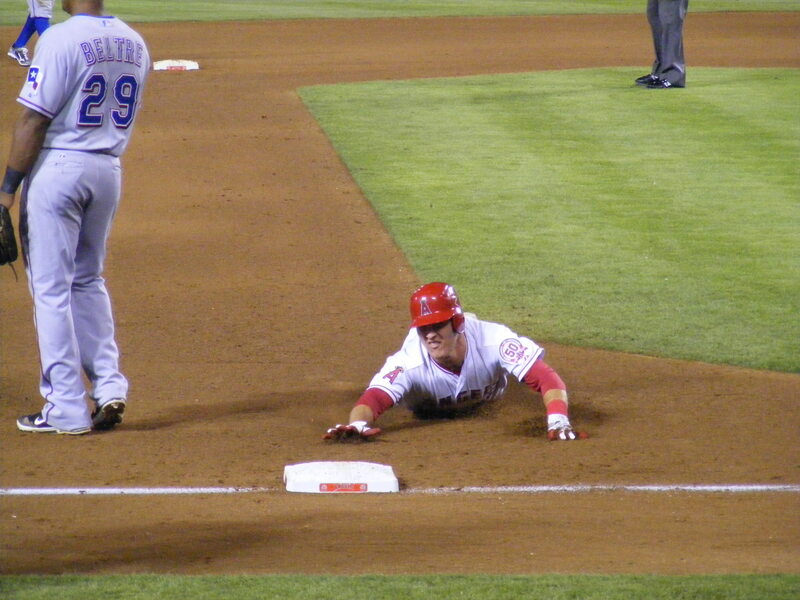 Conger walked over, picked it up, I asked for it and he lobbed it to me! #370. Just a couple minutes later a liner down the right field line took a bounce near the wall and I was able to reach out and snag that one… I have no idea who hit it. Someone on the Angels. 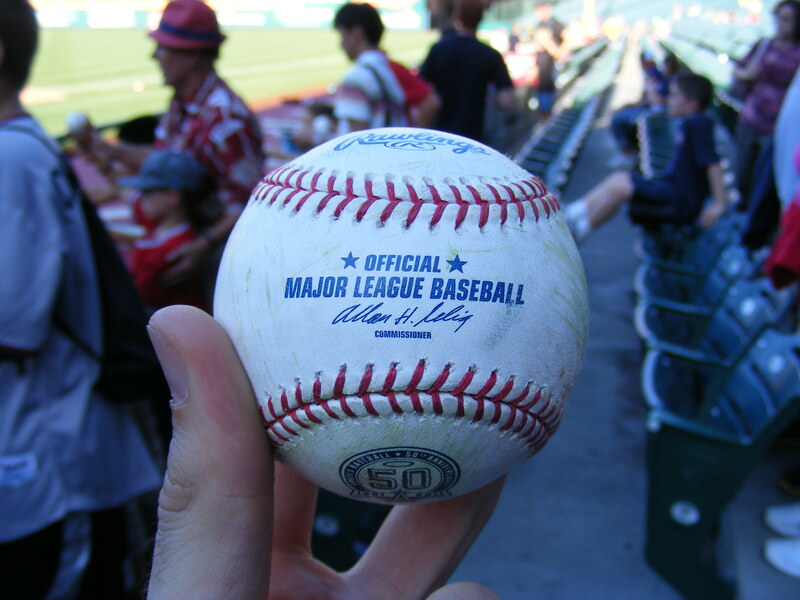 I ran up to the RF seats atop that 18 ft. wall after that and quickly got a ball thrown to me by Mike Maddux–it was stamped “PRACTICE.” Not all the Rangers were out on the field but Maddux and a few pitchers were and he tossed me this random ball that a Halo had hit. 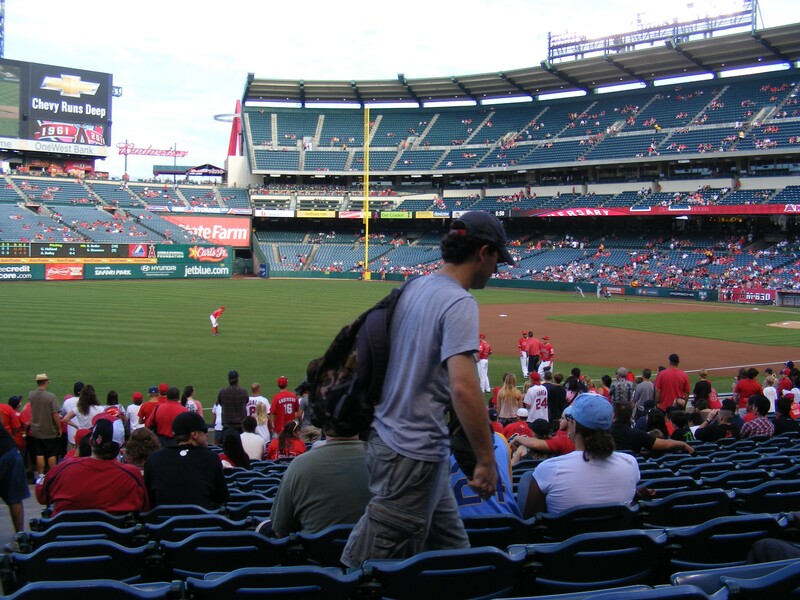 The Angels then ran off the field a bit early and I was bummed–but I had already snagged three baseballs at I’d only been inside the stadium for about 15 minutes! 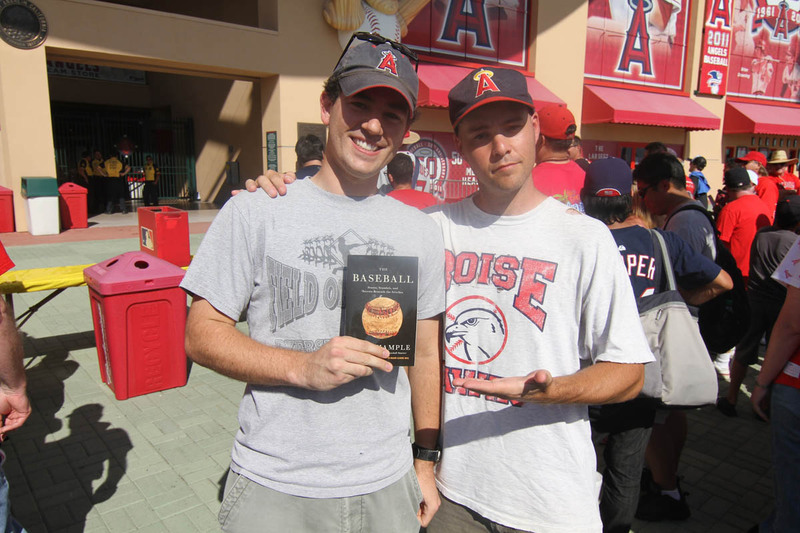 Greg’s goal was to snag a few Angels commemorative balls during his trip and I knew he’d get a couple–he’s no slouch as a ballhawk–but the first one he’d snagged on the day was a standard Selig ball. So were the first three I’d ended up with. –and I was quickly racking up the stats. 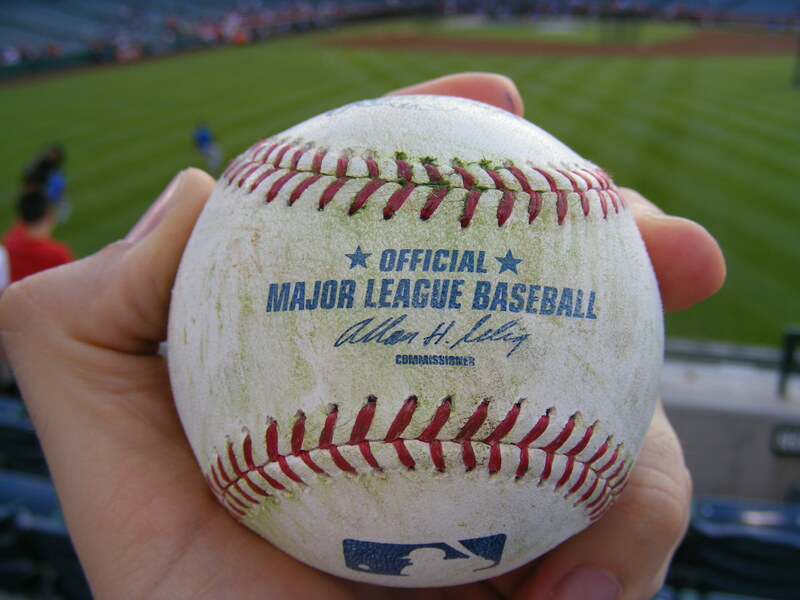 Next up I caught this beauty thrown to me by Leonys Martin. 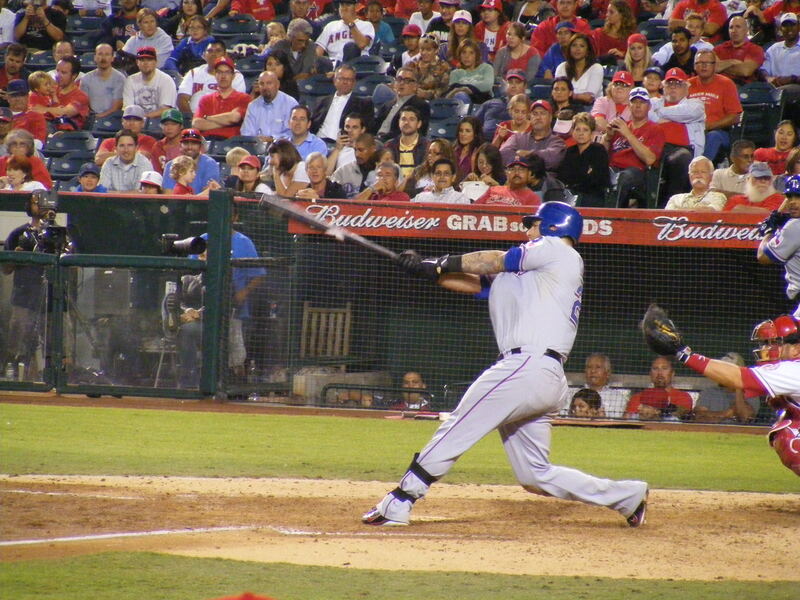 Then, the Rangers big left-handed power came to the plate–Mitch Moreland, Josh Hamilton, and David Murphy. Well, I snagged a Hamilton homer on the fly in the first round about halfway up the pavilion. That was career #375! 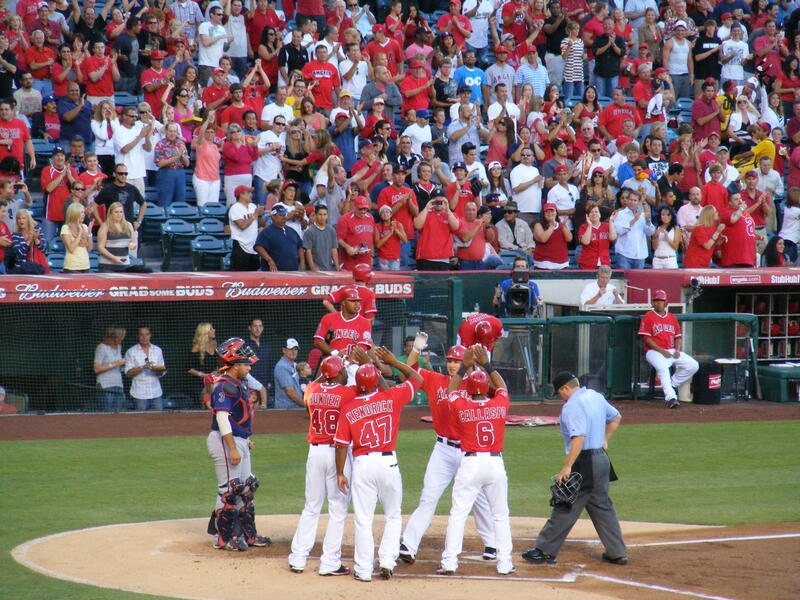 A few minutes later I grabbed a David Murphy bomb as it bounced around a row to my left. After a few more minutes Endy Chavez blasted a ball up to me in the pavilion that I snagged on the fly. That was my eighth ball of the day. The Rangers headed into the dugout soon after that and I failed to get anything tossed to me as they left the field. But I just needed two more baseball to get to my first double-digit game EVER! Plus, I hadn’t snagged a commemorative ball yet on this day. All eight had been standard Selig balls. And we’d continue to run into each other throughout the evening. 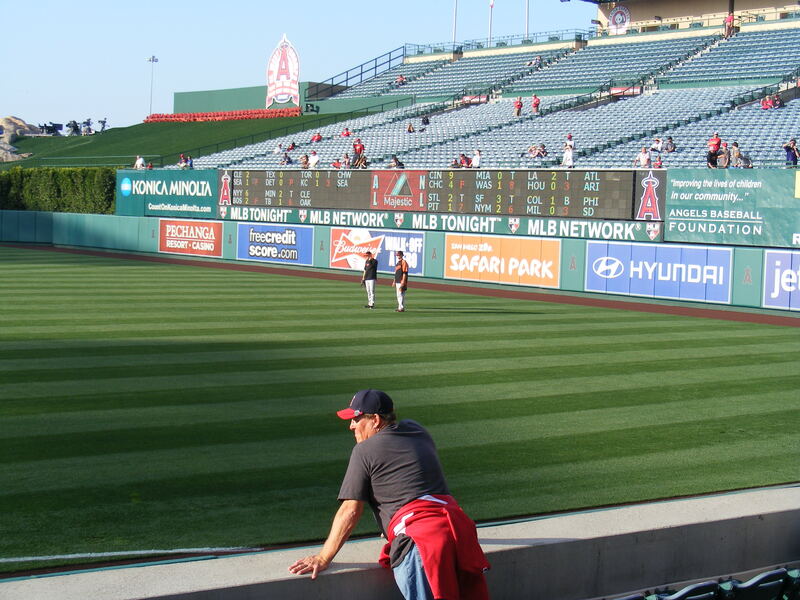 I took a brief rest before heading over to shallow left field to wait for the Angels to throw. Sure enough, after Torii Hunter accepted an award for citizenship, Erick Aybar and Maicer Izturis played catch for a few minutes along the foul line (as did a few other Angels). 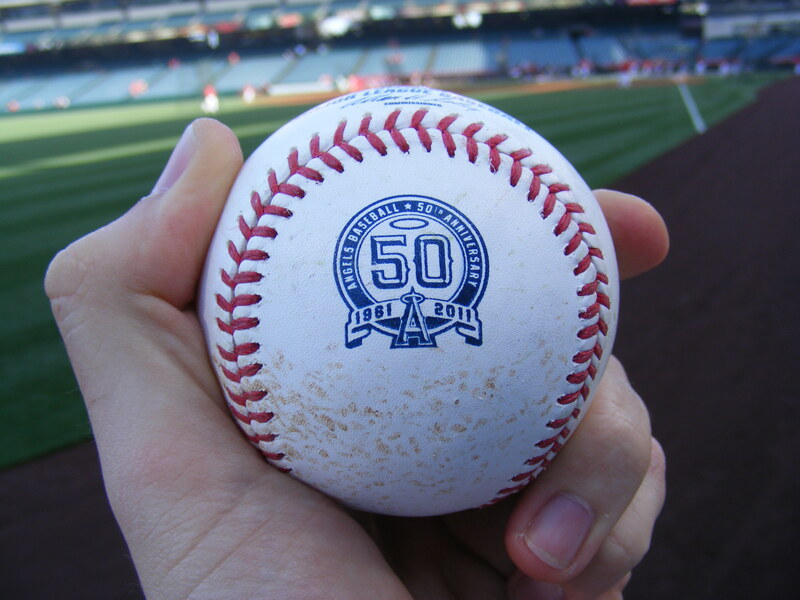 When they were done, Aybar threw me the ball they’d been using–and it was commemorative! That would be the only commemorative logo I’d take home that night… but I was up to nine baseballs! By the way–did you notice in that photo that the Tigers beat Cleveland 14-0? Wow. 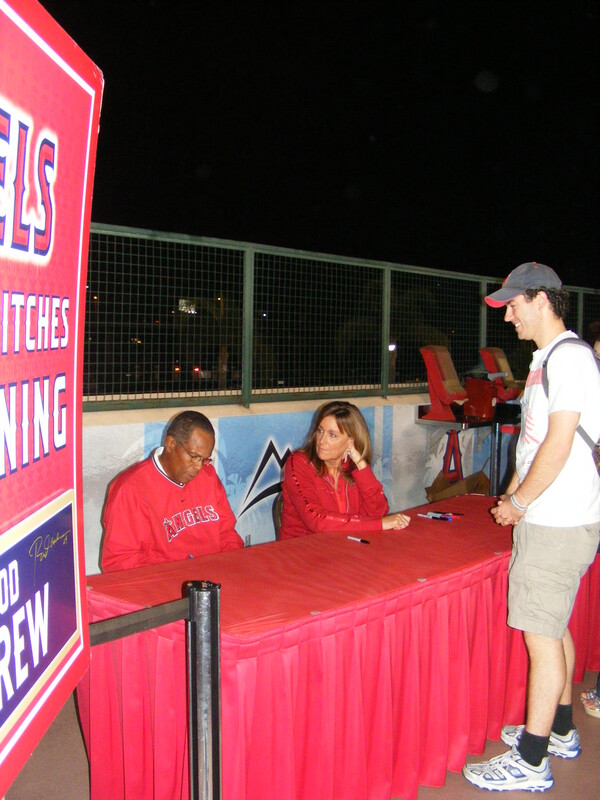 –of Rod Carew! This was actually the second time he’d signed a ball for me. The first time had been totally random and not nearly as organized. 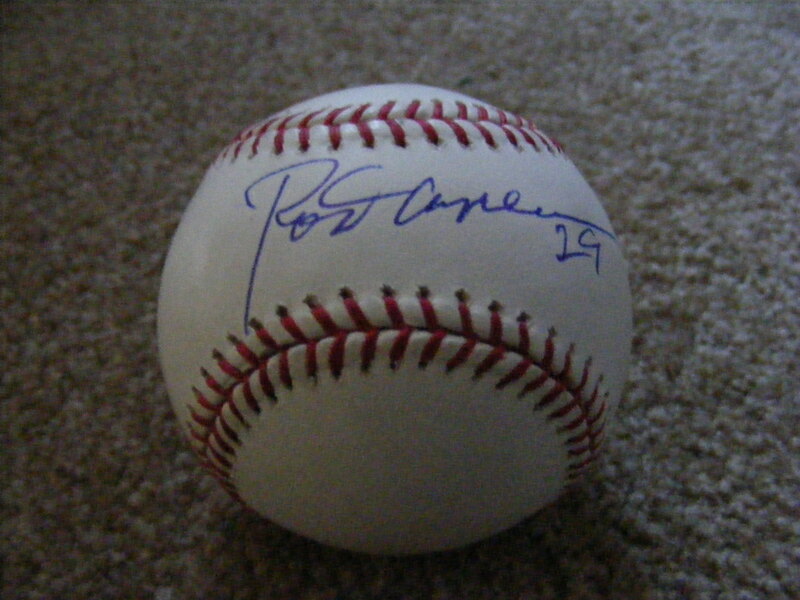 This time, instead of signing my ball and inscribing HOF ’91, he inscribed #29 next to his name. Rod’s a great member of the Angels community in Orange County, even though he’s more famous (and in the HOF) as a Twin. Eight balls snagged and one HOF autograph and the game had just begun! I told Greg I’d see him later or at the next day’s game and Michelle and I found some seats down the first base line. Dan Haren pitched well, however, giving up just three earned runs over eight innings. C.J. Wilson pitched two innings… he’d be pitching Game 1 of the ALDS later in the week. But, while the Angels could muster a bit of offense, they’d end up losing 4-3 and their slim playoff chances would be dashed. Michelle would end up leaving the game early to get ready for work the next morning–I made sure to stay to the end. I’d been trying for third out tosses all night but I’d been unsuccessful. 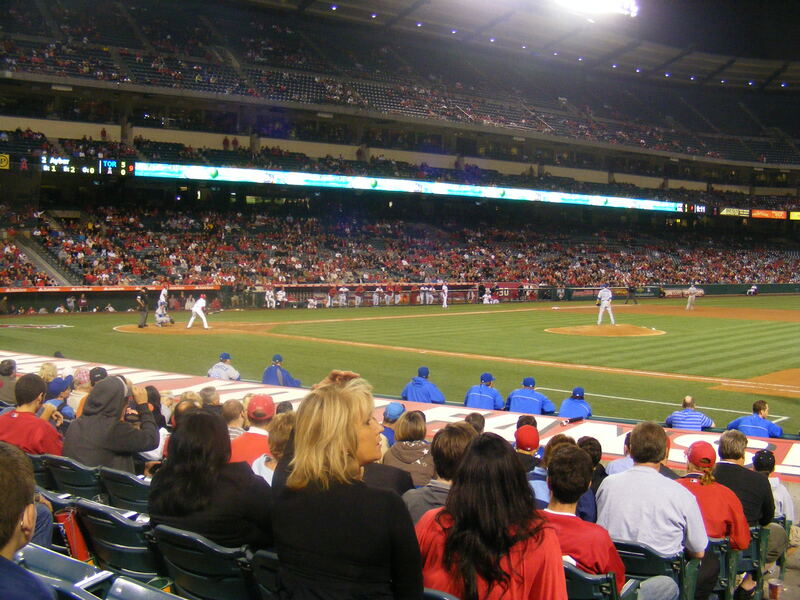 In the eighth, I was over on the Angels’ side… but headed to the Ranger dugout for the ninth. 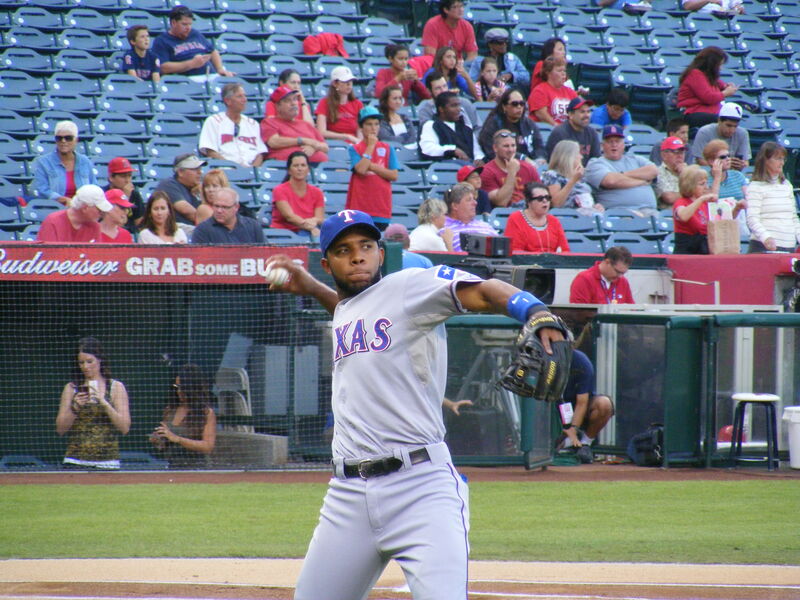 Sure enough, the Rangers locked down the win and Neftali Feliz got his 31st save. I waved at all the players as they headed off the field and they all passed by me–I watched the bullpen guys march across the field… the tallest guy had a baseball… it was Alexi Ogando. Would he remember me from the afternoon? He’d already given me a ball and I hadn’t changed my appearance in any way. 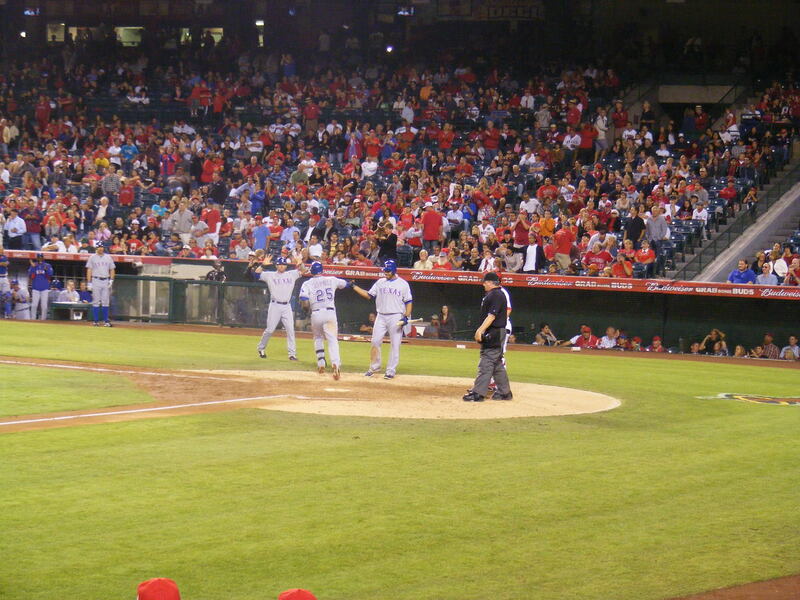 As the relievers lumbered in I made my best effort… hands up, waving, and I called out, “Alexi! Right here! 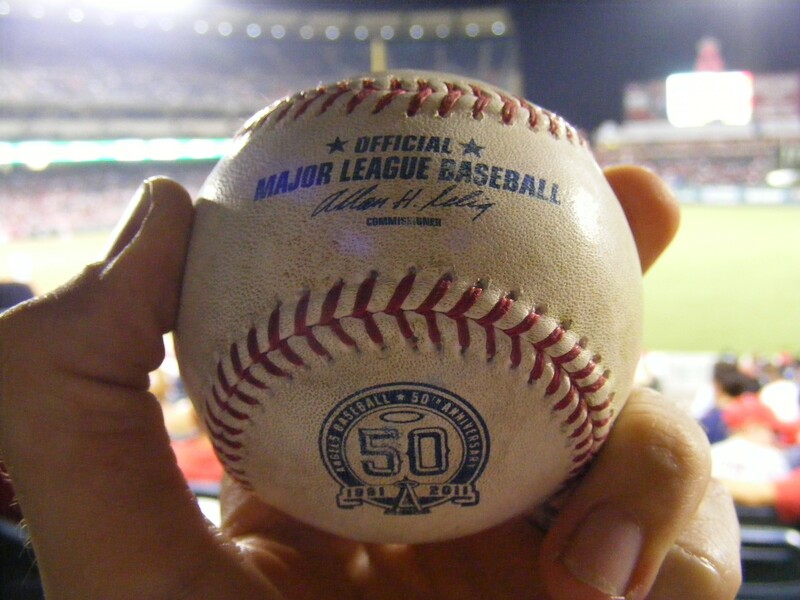 !” He looked up, pulled his hands out of his hoodie, and lofted ball number 10 right to my waiting glove. And just like that… with my 379th ball, at my 84th game at Angel Stadium since 2008 (when I started ballhawking) I FINALLY reached double-digits! I was thrilled–and the ball from Ogando was a rubbed up beauty–pristine. 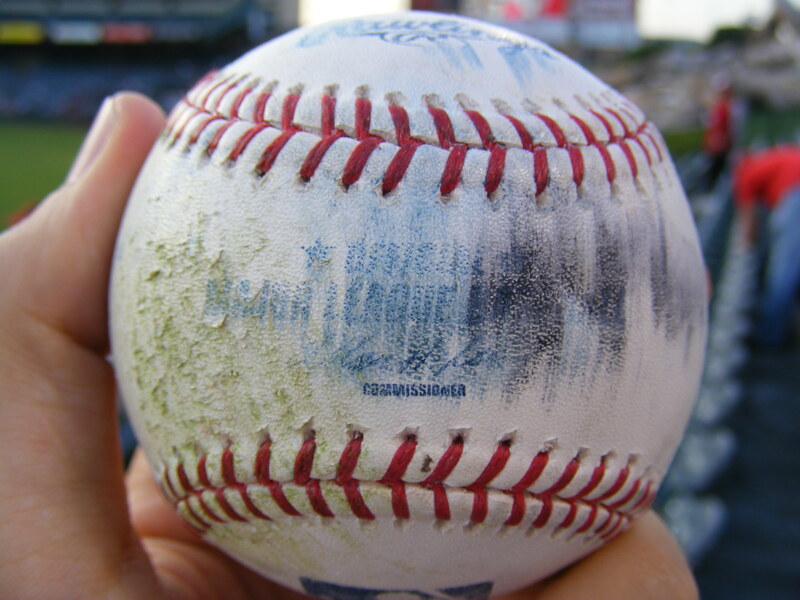 It had been rubbed with mud and never dropped, scuffed, or hit in any way. It was perfect. And with that I took my leave of the Big A.
I would be back quite soon. UPDATE: I found my notes from this game AND my following two games. Since 9/26/11 was a special day for me–I thought I’d share my notes. This is the list I take to every game I go to. And now you’ve got a window into how I keep these things categorized and how I remember things for my blog. It looks like chicken scratch, I know, but you can see I write a letter L next to each player if they’re a lefty. 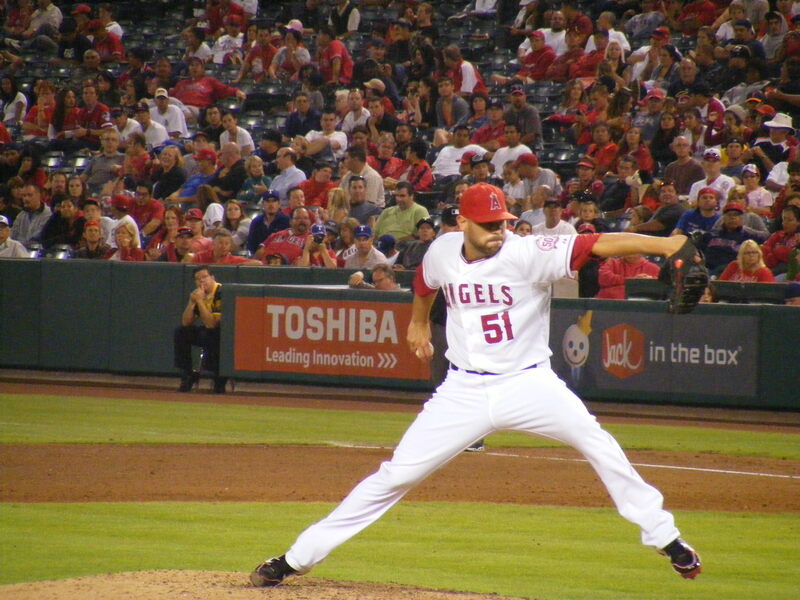 For pitchers, if they throw left-handed… for batters, if they hit left-handed. Or they get a letter S if they’re a switch hitter. The starting pitcher is circled on each roster and each ball I snag is labeled with a number and a circle. 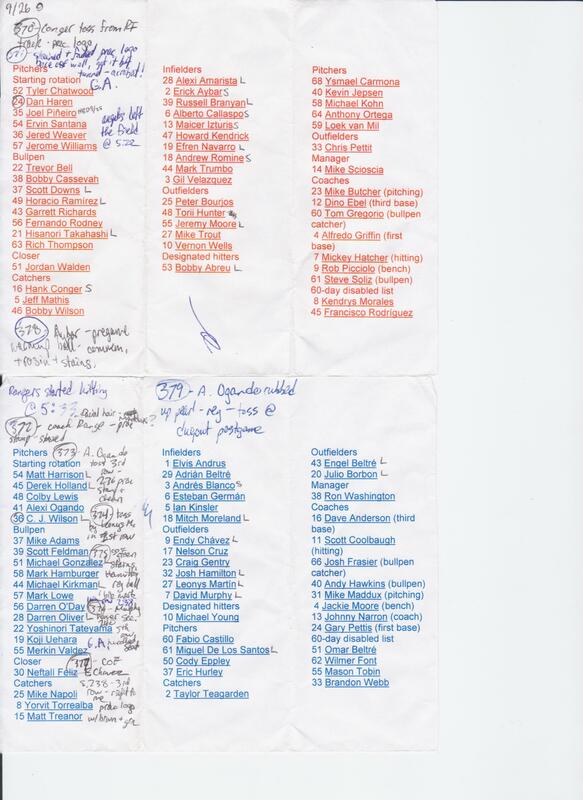 For example, Ball #377’s note is “377 – COF (which means Caught On Fly) E. (Endy) Chavez S. 238 (Section 238 of the right field pavilion) – 3rd row – right to me prac logo w/ brwn + grn (it was a ball with a practice logo and brown and green marks on it). Want to know more about my notes, or care to explain how you make your own? Let me know in the comments. Ah, Labor Day. A perfect day for a trip to the ballpark! 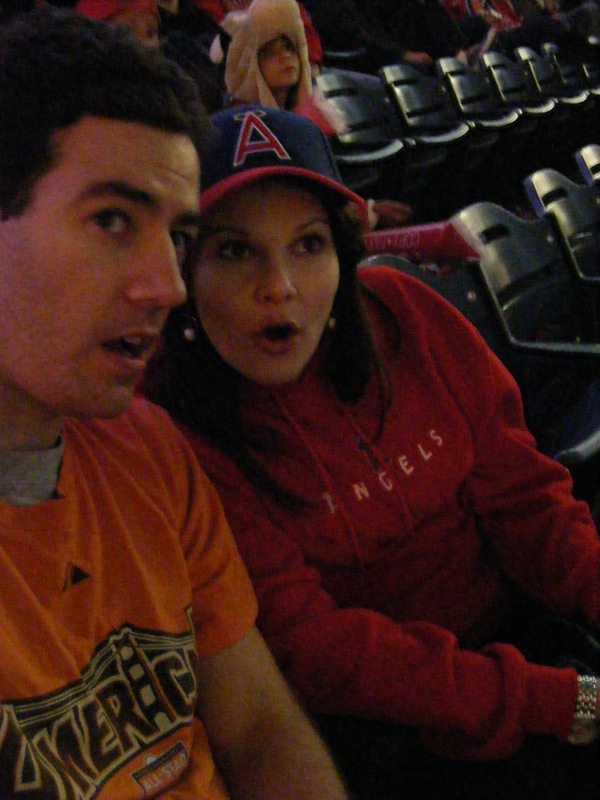 And I was taking my wife with me to watch the Angels take on the Mariners in this AL West showdown. Also in attendance was Zack Hample–ballhawk extraordinaire–and as I stood in line in the fifth of five lines I noticed him a few lines over. Zack had been speaking with a columnist from the OC Register but took a moment out of his media day to pose for a photo with me and sign my copy of The Baseball that he’d published earlier in the year (photo courtesy of Zack’s blog–and Brandon Sloter). We chatted about strategy and we’d end up running into each other throughout the day. And you can read Zack’s entry about this game on his blog. I ran in and quickly made it out to the right field seats. The gates had opened at 4:02pm and at 4:04pm I got my first ball of the day from Bobby Cassevah. A simple toss-up to get me on the board. Not five minutes later I scored my second baseball of the day by asking Hisanori Takahashi for one that he had fielded–I guess my Japanese is still passable. That ball had a practice logo on it. 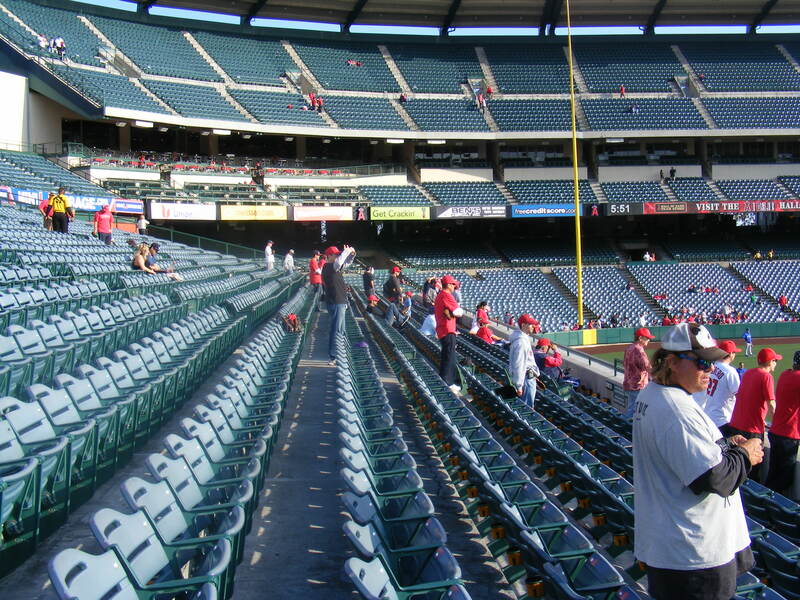 That was it for the Angels… they just didn’t have anyone hitting much out. I could tell Zack was a little frustrated–but he passed the time by talking to his reporter colleague and attempting to use his famous glove trick from atop the 18 ft. right field wall. A couple of us warned him that security didn’t like devices… but I guess he could always plead ignorance if they tried to stop him. I think he managed to get two baseballs before security asked him to step into the concourse–he was back a few minutes later–sans glove trick. That photo is courtesy of the OC Register… Zack and I are in M’s caps. 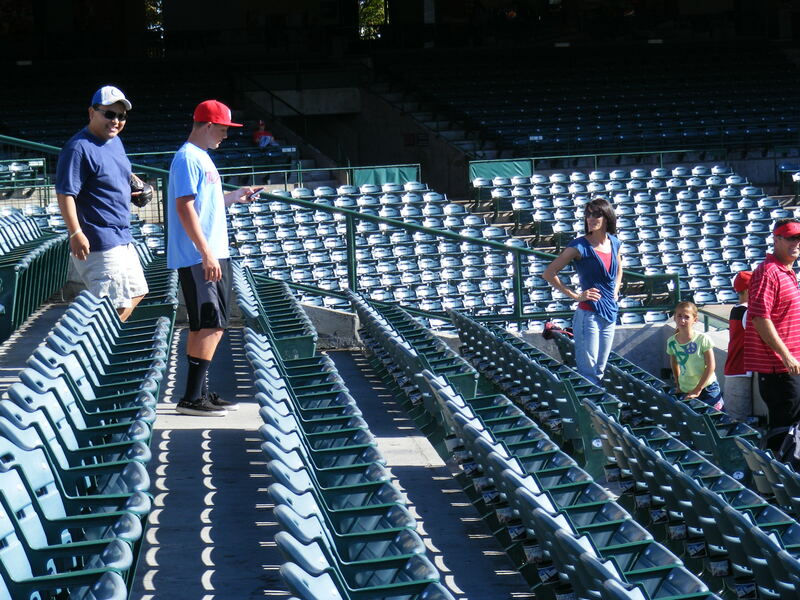 But I came up empty there and at the Mariner dugout. 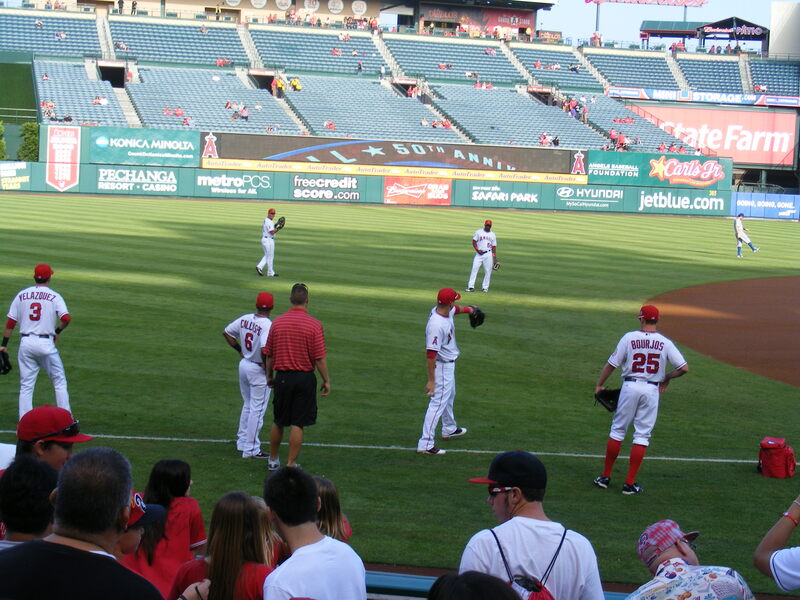 Next up, Angels warm-up tosses over on the LF line. 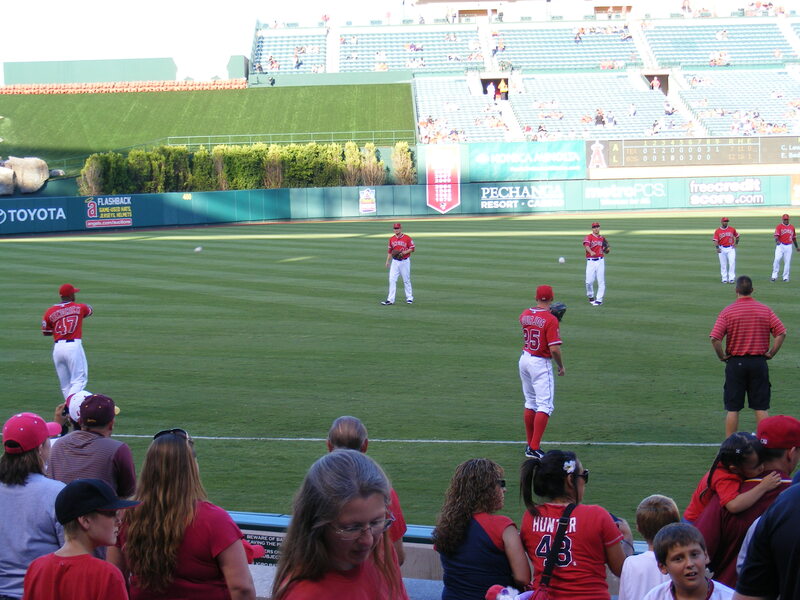 Michelle took this photo as I headed down to the field once the Angels came out to stretch. 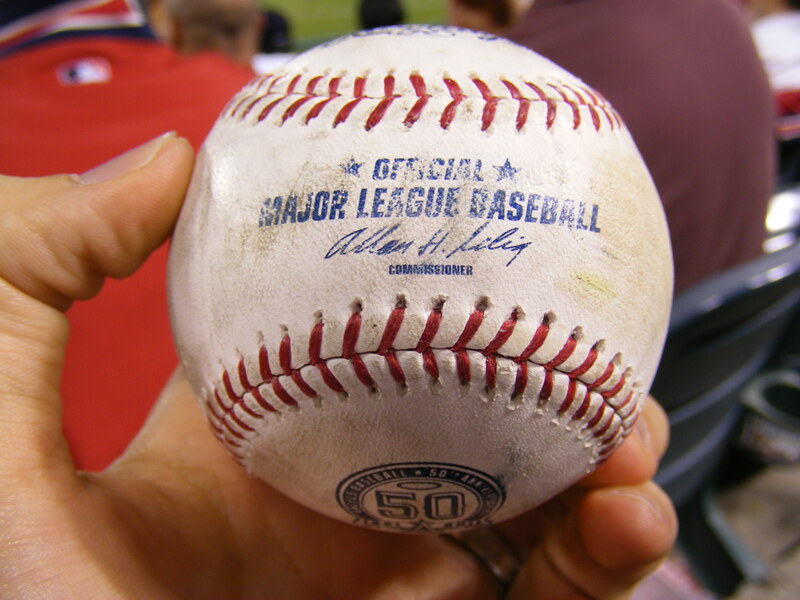 I was in the second row and got Maicer Izturis to toss me my fifth ball of the day–another standard Selig ball. I sat with Michelle down the first baseline a bit as the game got underway and headed toward the dugout whenever the Angels had two outs on ’em, hoping I could get a third out toss from Adam Kennedy, the M’s first baseman for the day. I saw Zack get one in the first inning–he had no competition, and he moves pretty quick! In all seriousness, there is a reason that dude has snagged as many balls as he has–he’s good. He’s fast, he plans well to find the right place to be, and he’s skilled. I’ve met Zack twice now (the last time was on 9/2/08 at Dodger Stadium) and he’s made some pretty impressive snags that I’ve gotten to see in person. On another third out try I leaped for a ball that Zack grabbed and I sort of fell into him a bit… no one fell down and I was glad that he could grab a gamer in Anaheim. I got my shot later on in the bottom of the sixth inning. Maicer Izturis grounded out to Adam Kennedy at first and Kennedy stepped on first, then headed to the dugout. I was five rows back in the aisle and he tossed the ball my way. It went just over my head and to the right but got bobbled by a fan behind me and the ball dribbled back to the aisle where I nabbed the game-used commemorative for my sixth on the day! I wasn’t going to catch Zack (who’d end the night with eleven baseballs) but I was going to come away with a respectable number. 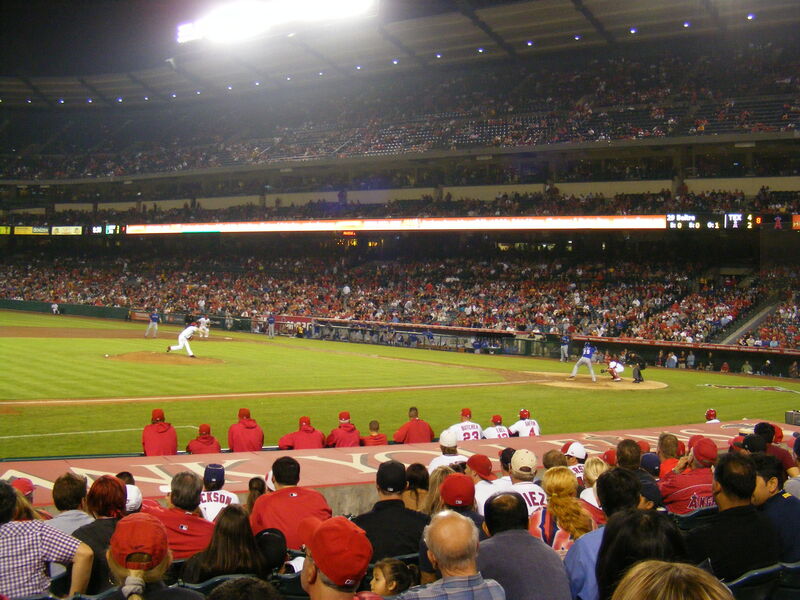 The game was winding to a 7-3 Halos victory powered by Mark Trumbo and the heart of the order and by the end of the evening the Angels had advanced to within 2 1/2 games of Texas in the American League West. After the final out I got my seventh and final ball of the day from Jason Vargas before he retreated into the clubhouse. Michelle and I chatted with Zack for a moment in the seating bowl, Brandon took a picture of us… and then he and I went our separate ways. It had been a pretty darn good holiday weekend. 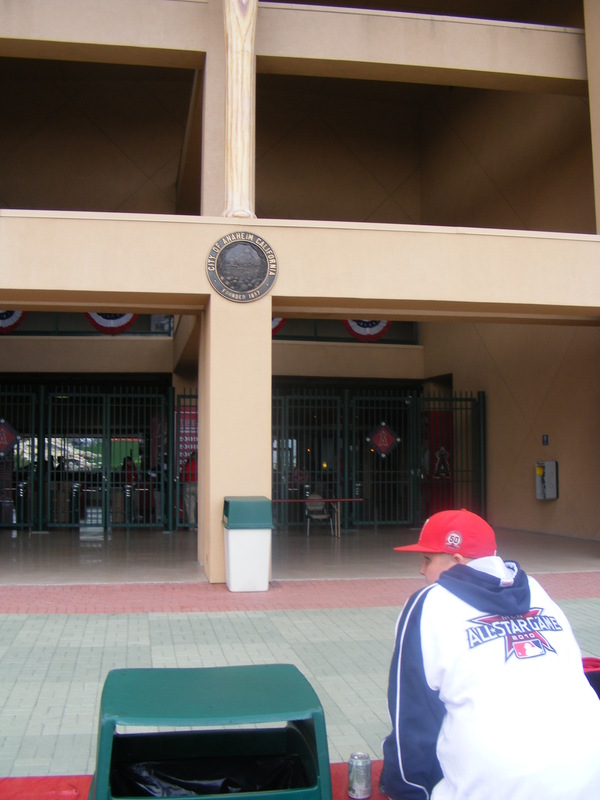 I headed off to Angel Stadium for the 6:05pm game at 3:00pm, got there at about 3:25pm, and waited in line for the gates to open. This Saturday night game would have a postgame concert after it ended (by Ne-Yo–who’s very popular, I’m told). A big crowd was expected. I had contemplated driving down to see the Padres play instead but decided on a game in Anaheim. I’m glad I did. After playing catch with a few regulars for about ten minutes I got back in line just before 4:00pm, when the gates were set to open, and readied myself for my sprint out to right field. Typically, my routine consists of tightening and retying my shoelaces, a little bit of stretching, unzipping the pockets of my backpack (so security folks can check it quickly), and placing my ticket (bar code up) in my hand. Well, I did all that and still wasn’t the first fan in the gates–but luckily a lot of the early arrivals to the stadium were planning to get autographs, not baseballs. And I was all by myself for a good twenty seconds in the pavilion. Sadly, it didn’t really help me: no Easter eggs, no toss ups, no BP blasts hit to the seats during my first moments out there. My first baseball of the day was tossed up by rookie pitcher (and former Redlands East Valley Wildcat) Tyler Chatwood. 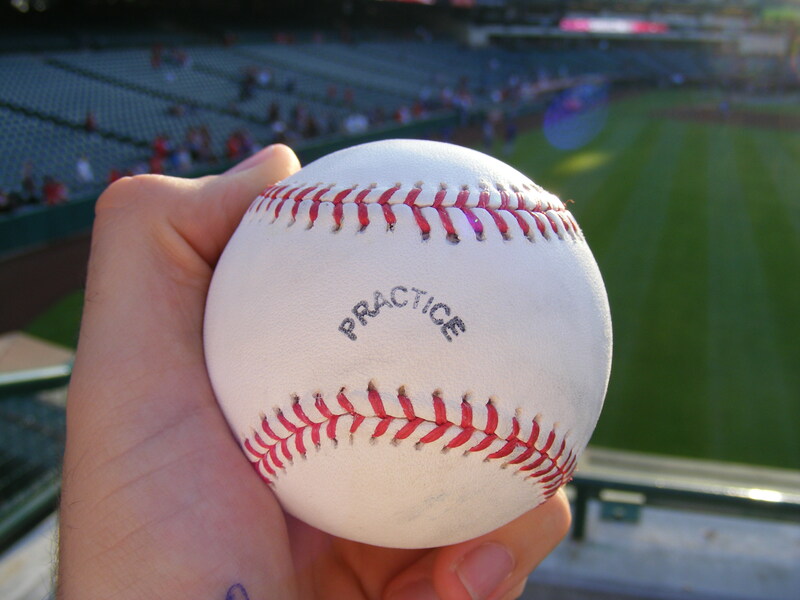 He threw it to me in the first row (shown above), it had the word PRACTICE stamped on its sweet spot (shown below), and I’d eventually end up giving that ball away to my favorite usher, Barbara, who’s always out in the right field pavilion. She finds a little kid at some point during the game to give the baseballs to after I hand them off to her–and the fact that I’ve got a good reputation with the ushers around the park is certainly helpful. Baseball #2 on the day came via Mark Trumbo and some of his opposite field pop. The rookie righty hammered a ball that ended up bouncing in the second row of Section 238 as I and a couple other regulars closed in on it. Lucky for me, the ball didn’t ricochet out of the row it had landed in and I grabbed it a second before the next nearest fan. This one, too, had a practice stamp on it (that was quite off-center), along with a blue smear over the logo. 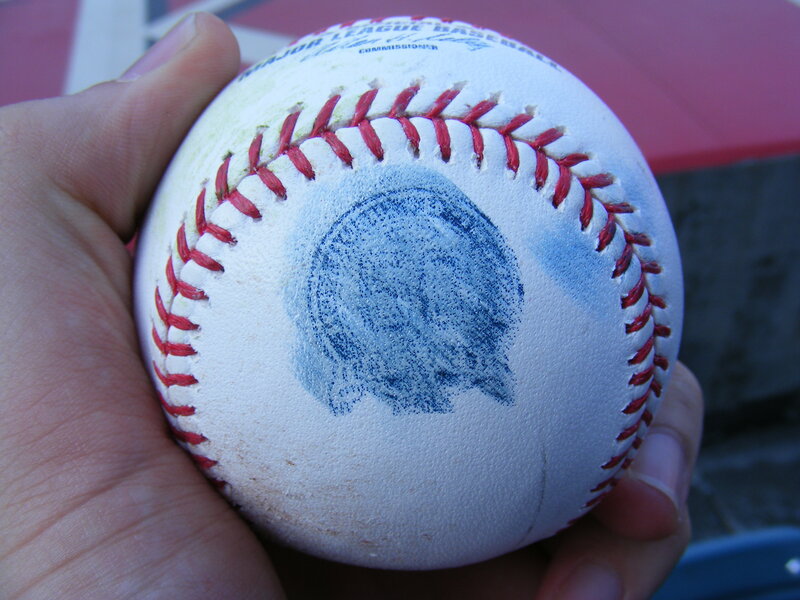 Does anyone know how baseballs get those blue streaks and smears across the leather? By this point the Twins had come out to throw along the right field line and I was thinking to myself, “Wow. 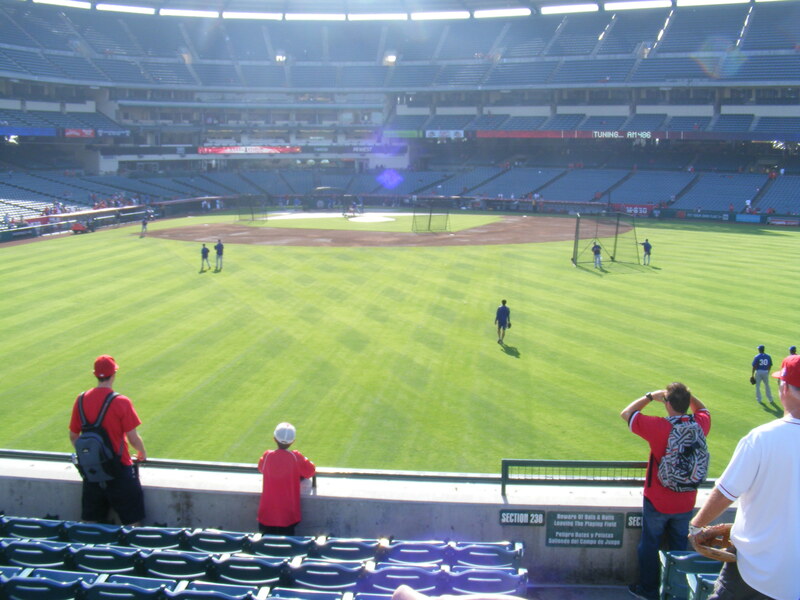 Four baseballs from the Angels–that’s more than usual.” After Matt Capps finished his warmups I was standing in the fifth row of Section 133 and held up my arms while yelling, “Matt! Over here!” Capps lofted the ball over the handful of fans in the first couple rows and into my waiting Mizuno for Ball #5 on the day. And this one was commemorative! 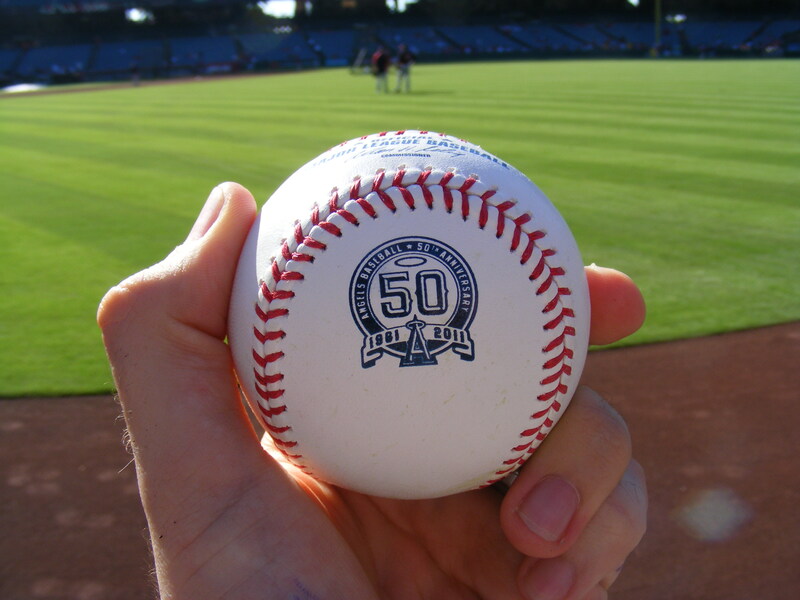 Lately I’ve noticed that the visiting teams to Angel Stadium tend to have more of the commemorative baseballs than the Angels. At that point I decided to play the short wall in the right field corner as there was still some space to move around along it. After a few minutes an unknown Twin hit a ball that I was able to scoop off the track. I gave that one to a kid nearby (he and his buddy are in the photo to the right)–and I told his friend with him that if another one came that way I would try to snag it on his behalf. Not five minutes later, a Twins lefty smacked a fly ball our way. At first I wasn’t sure if it would hit the grass and roll to the wall, hit the dirt and bounce over the wall, or clear the wall and end up in the seats. I was at the wall when the ball was hit, then hen the ball was at its apex I took a step back, thinking it definitely would not hit the grass. As it descended I came to the conclusion it wasn’t going to be a home run either–it wasn’t. The ball hit the packed dirt of the warning track and bounced high over everyone’s head in the first row–and over mine in the second row. I hurdled the seats behind me and snagged it in the fourth row. Then, with a smile on my face, brought it to the second kid I’d been talking to and said, “I’m a man of my word.” I handed the ball over and the two kids were thrilled. And at about that point BP was winding down–as it ended I ran to the Twins’ dugout and as Nate Dammann jogged into the dugout he flipped me a beat up and stained commemorative baseball! That made 362 baseballs in my lifetime and that one from Dammann was my ninth on the evening. A new record for me! I’d previously snagged eight on two separate occasions and now I had pushed my record one step closer to double digits! I thought I had a really good shot to get there, too, since I still had pregame warmups and the entire game to get one more ball. But wouldn’t you know it, I didn’t snag another for the rest of the night! I tried to get one from the Angels after they did their throwing. I tried to get a ball from either first baseman (Mark Trumbo and Luke Hughes), I tried to get a foul ball… and all I got was a lot of exercise. The game was pretty exciting though. The Angels got out to a quick lead when Trumbo hit his first career grand slam (and his 25th homer of the season) off Twins starter Brian Duensing in the first inning. 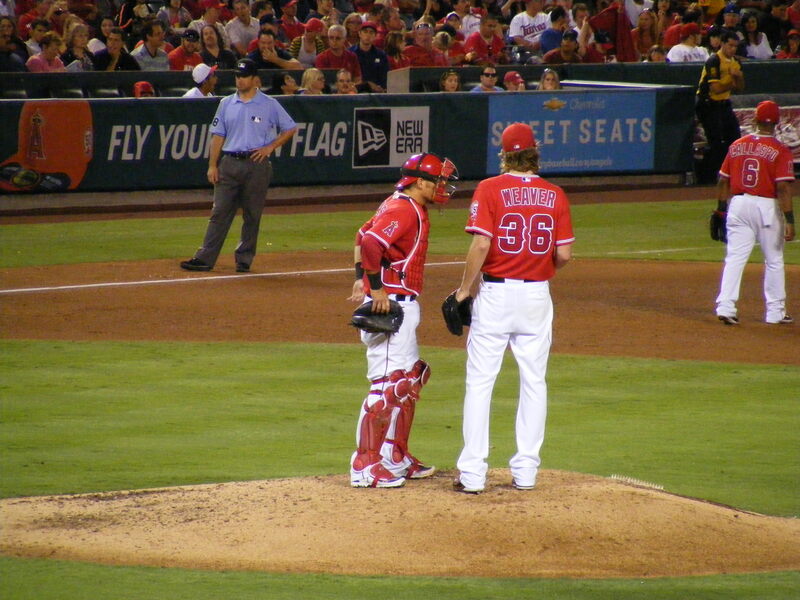 The way Jered Weaver had been pitching all year everyone in the stadium was sure that would be all the offense the Halos needed. But the Twins got three runs in the second and three more in the fourth–and that tied the game at six. Weaver definitely wasn’t at his best. 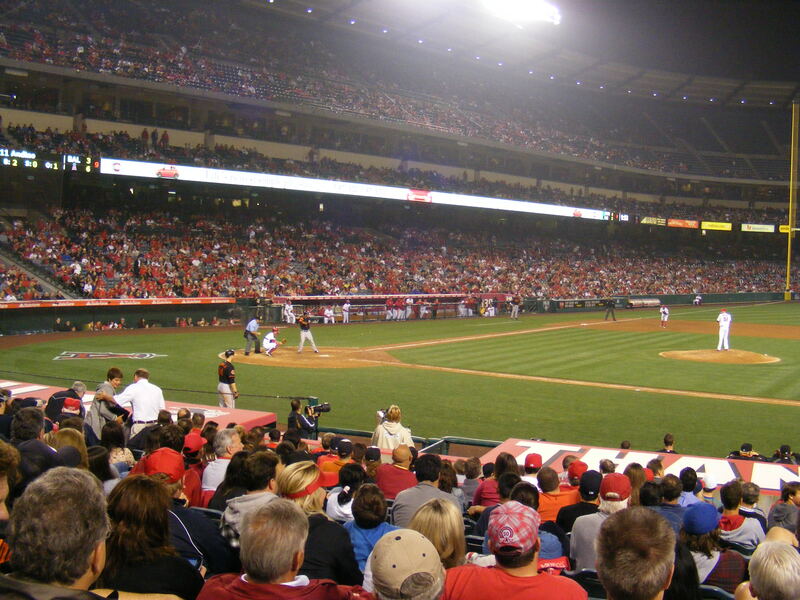 Vernon Wells smacked a solo homer in the fifth to put the Angels up for good–and they’d add three more runs in the sixth with a home run, an error, a single, another single, and a double. 10-6 was the final and Weaver got the win–but he didn’t look great. 5IP, 8H, 6ER, and 3BB to go with his eight strikeouts. The bullpen shut the Twins down though. Mike Trout had three hits and six of the nine starters had at least one RBI. 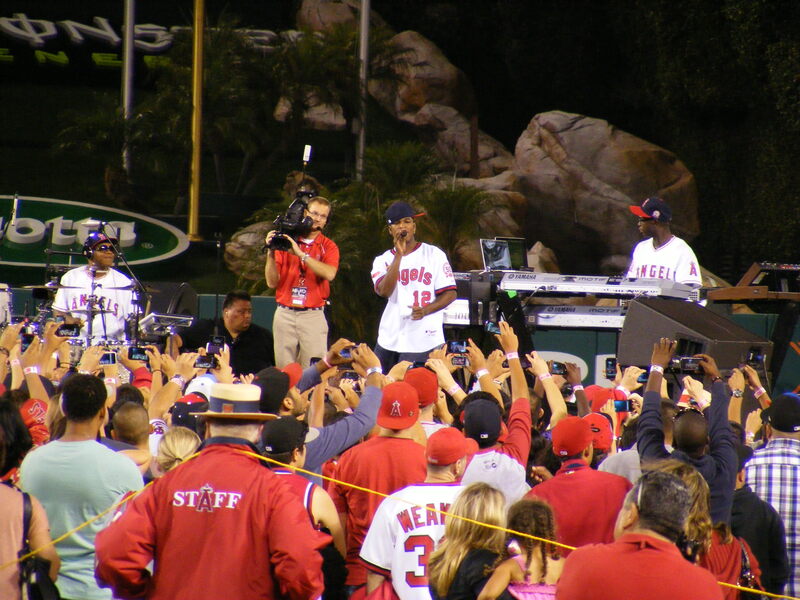 The win put the Angels 3 1/2 games behind Texas AND there was a post-game concert on tap: Ne-Yo. Apparently he’s a pretty big deal. This was the final concert of the Summer Concert Series and girls go crazy for this dude. I’d heard maybe one of the songs he sang on the radio but I’d at least heard of him before so I’m not totally uncool. 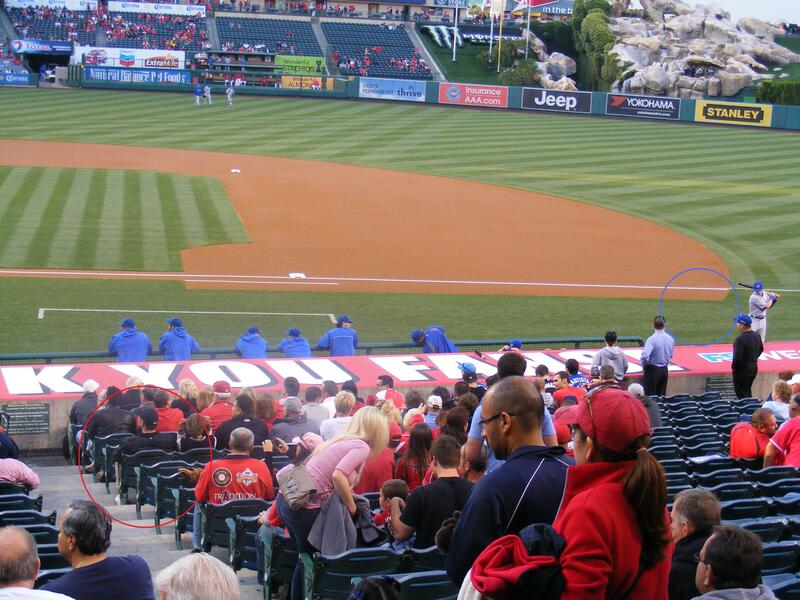 I watched as Angels and Twins players and their families took in the show from their corresponding dugout. Howie Kendrick and Ervin Santana played with their kids on the grass–it was cute. And I left before Ne-Yo’s last song so I could beat the traffic. It was a record-setting night for me–but that double-digit game has still eluded me–we’ll see if I can make it happen before the end of the season.